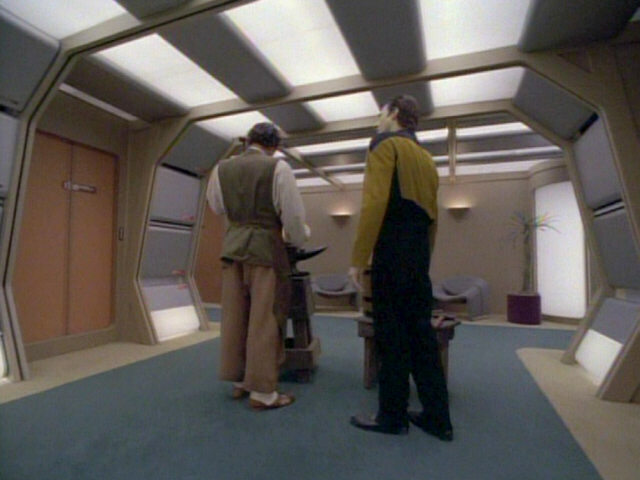 Ex Astris Scientia - Observations in TNG: "Birthright I"
Observations in TNG: "Birthright I"
Here are some observations about sets, props and visual effects in TNG: "Birthright I" without a specific theme, and a comparison of the original TV release (TNG) with the remastered episode (TNG-R). 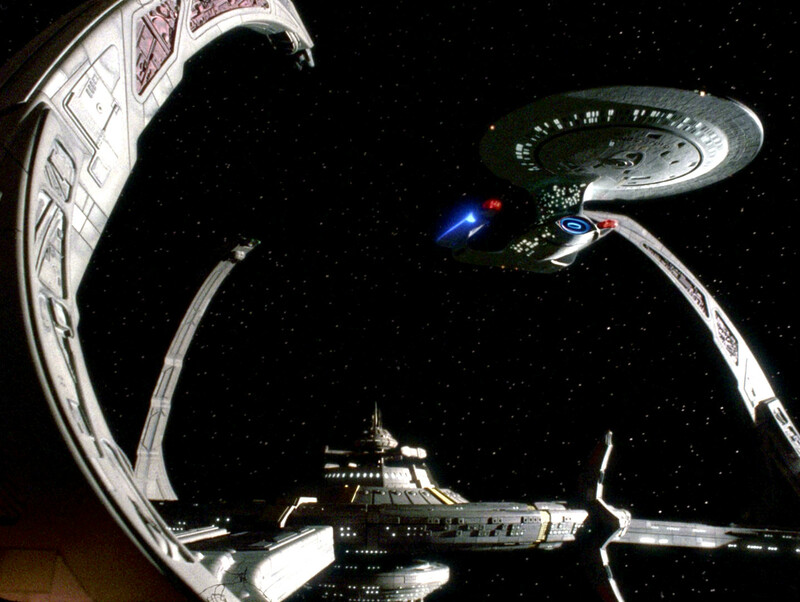 This impressive shot of the USS Enterprise-D and Deep Space 9 was originally created for "Emissary", the DS9 pilot episode. 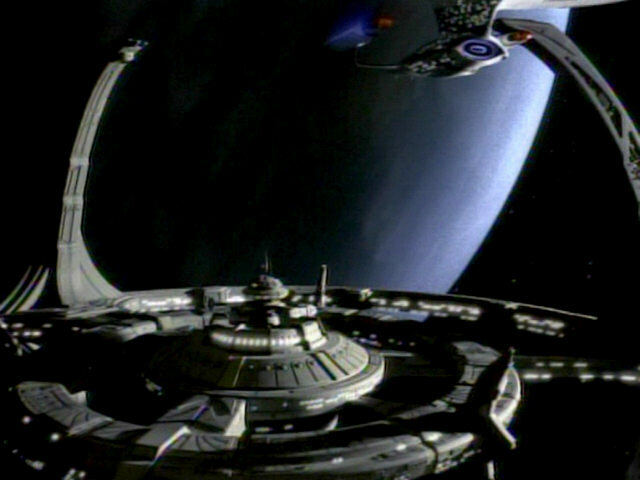 It was only re-used four times in later DS9 episodes. 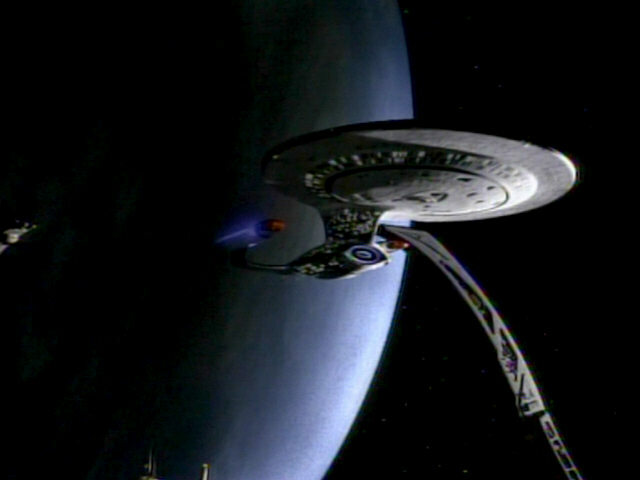 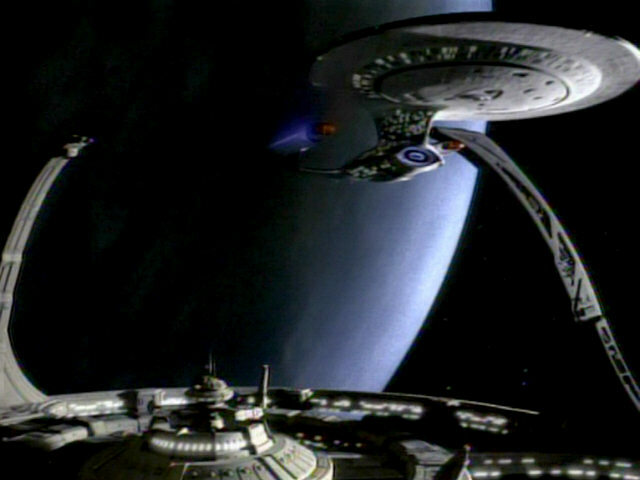 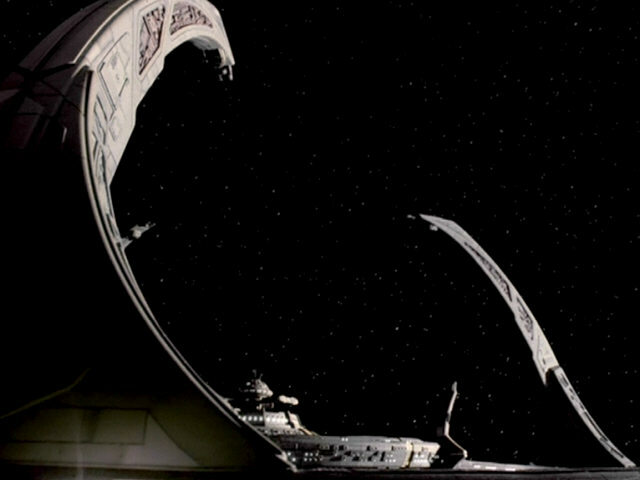 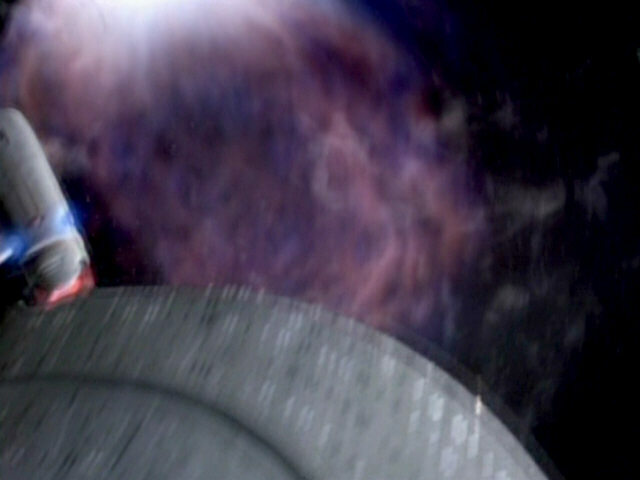 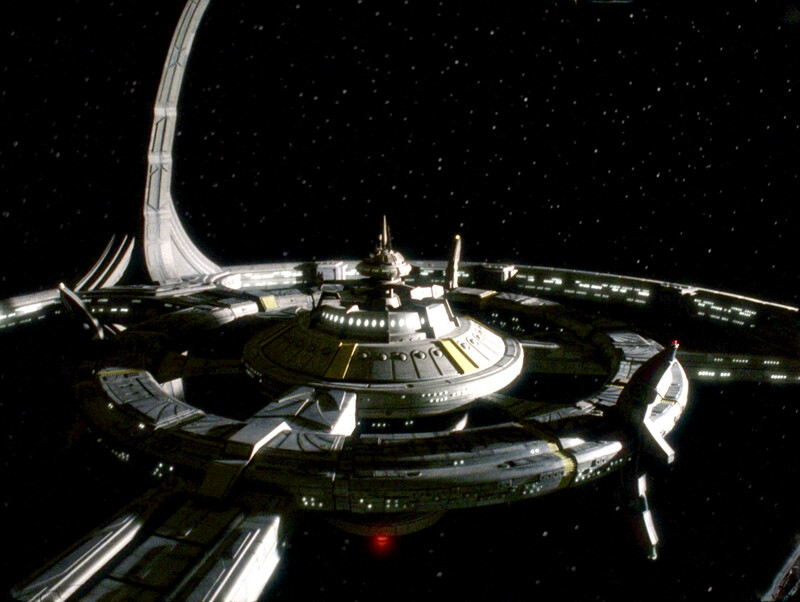 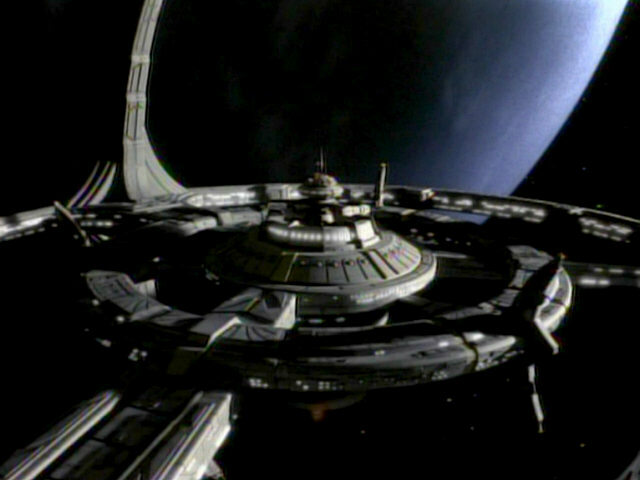 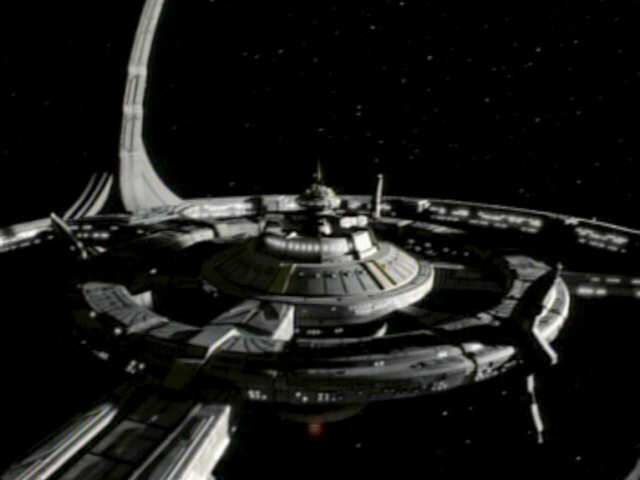 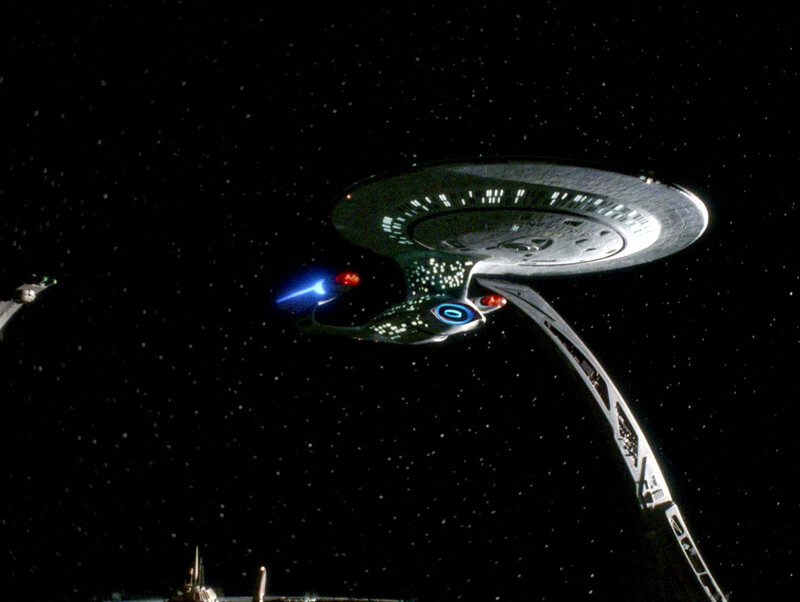 In the season 2 finale, "The Jem'Hadar", nearly the complete shot is re-used, the Galaxy-class ship representing the USS Odyssey in the episode, only Bajor is missing. 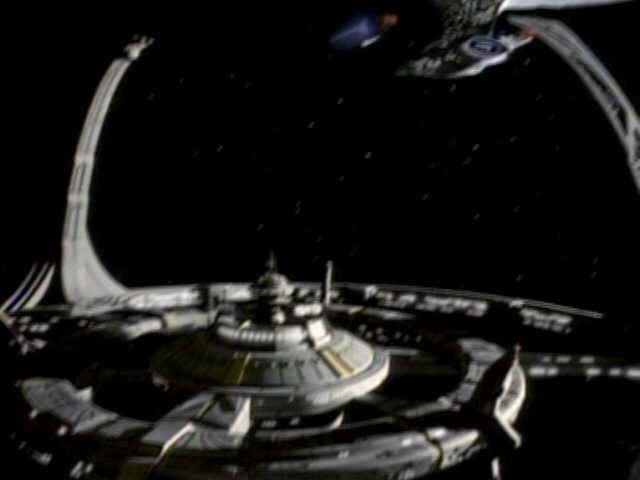 After that, the footage of DS9 without the USS Enterprise or Bajor only appeared in "Crossfire", "The Begotten" and "Blaze of Glory". 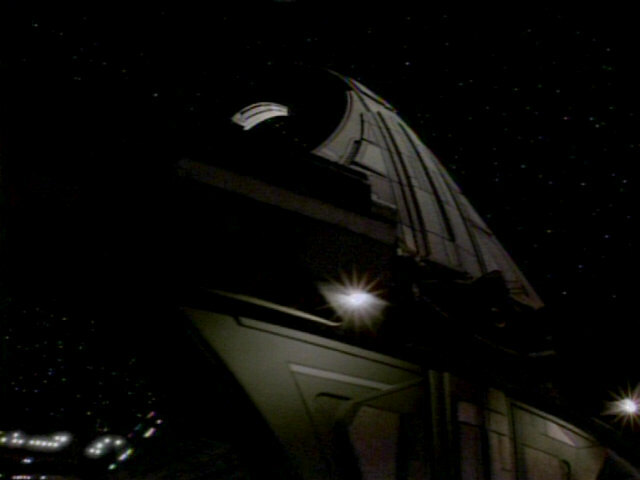 DS9: "Crossfire" This is sort of a preview of Deep Space Nine in HD. 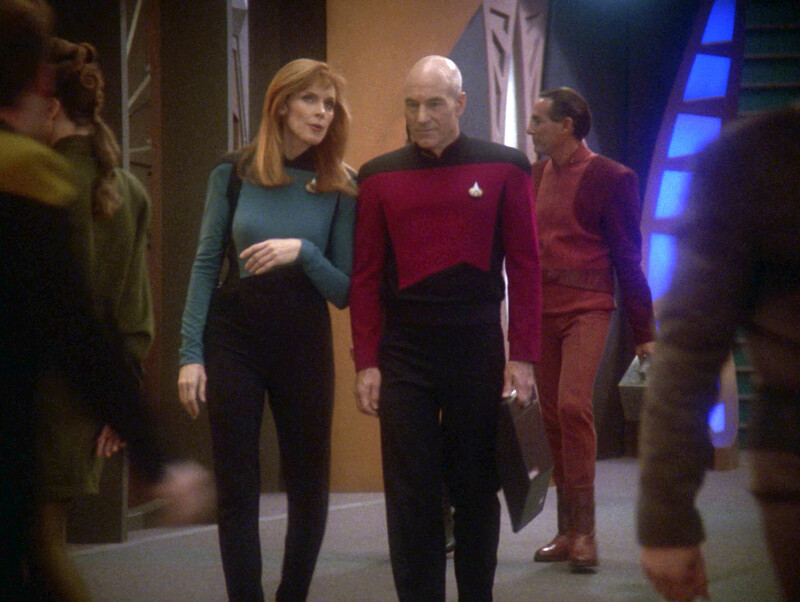 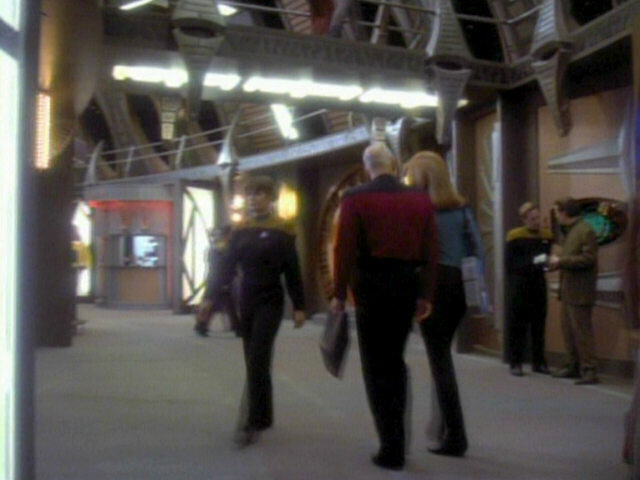 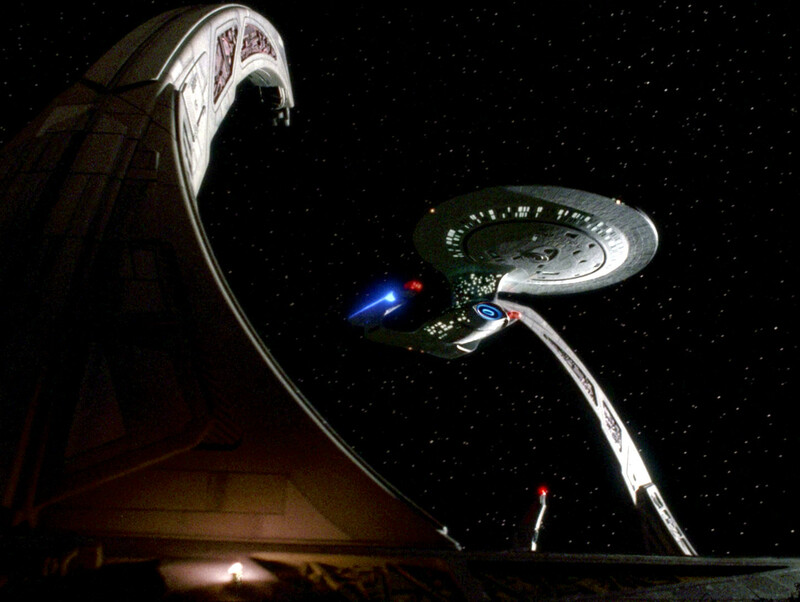 A painted docking corridor set extension can be seen in the background as Picard and Crusher leave the docking bay. 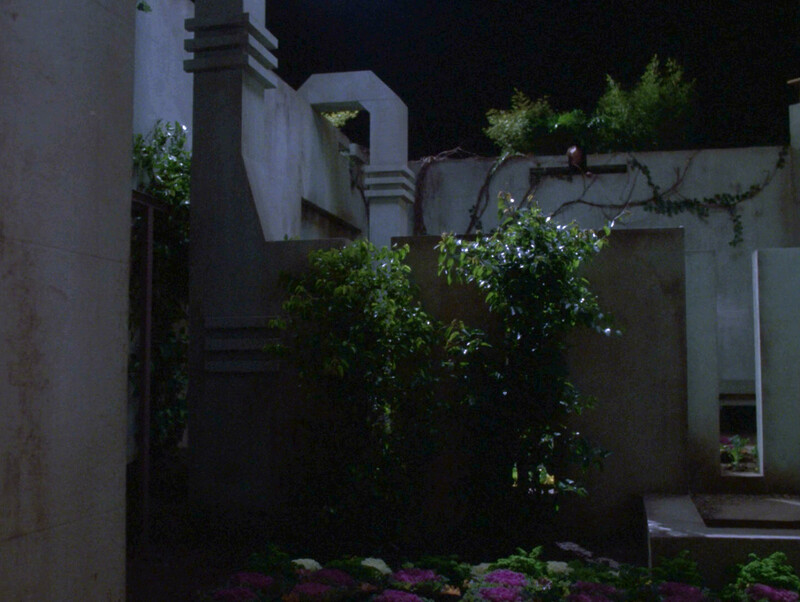 Prop and Set Oddities The painted extension in HD. 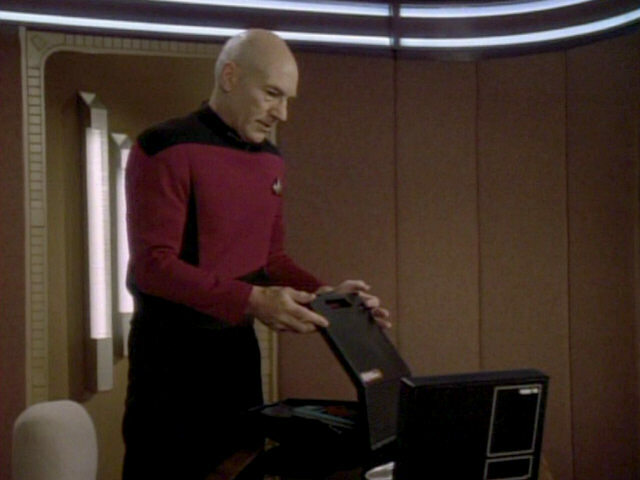 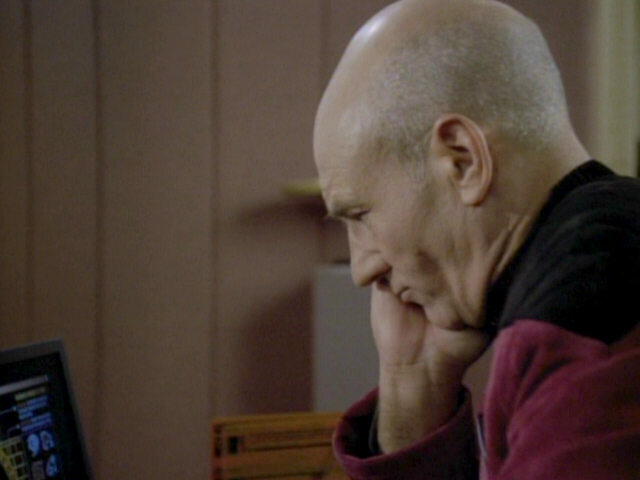 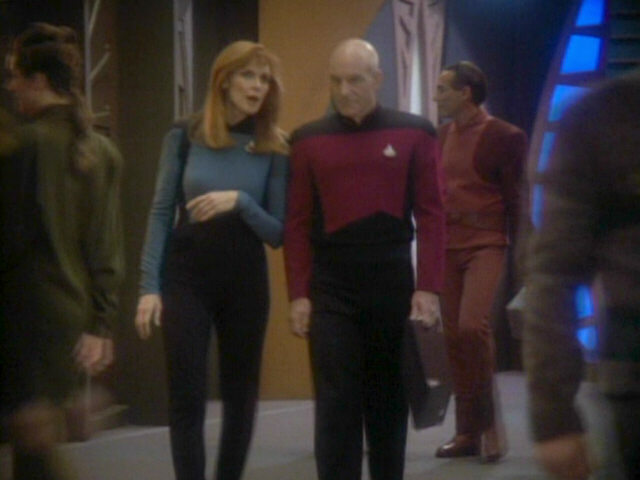 Picard is seen carrying a small black travel case in this episode. 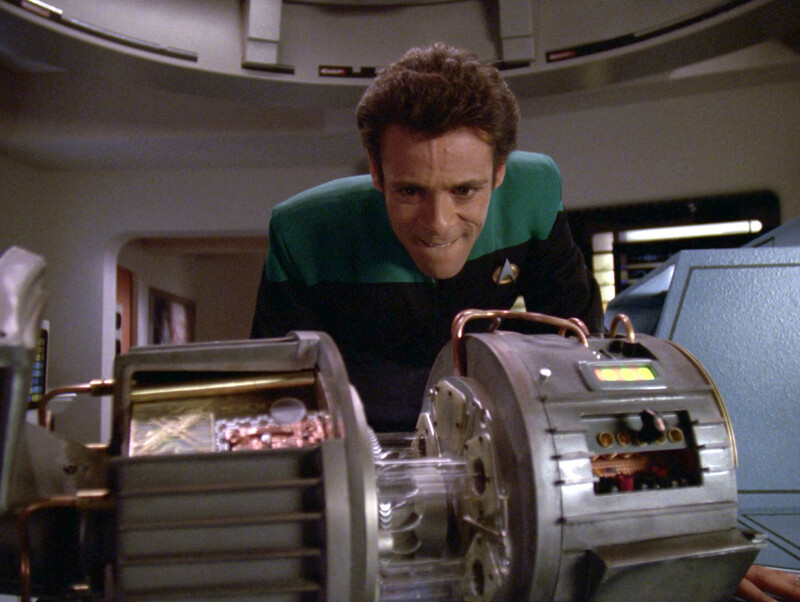 He uses the same case in "Starship Mine" when he has to leave the ship during the baryon sweep. 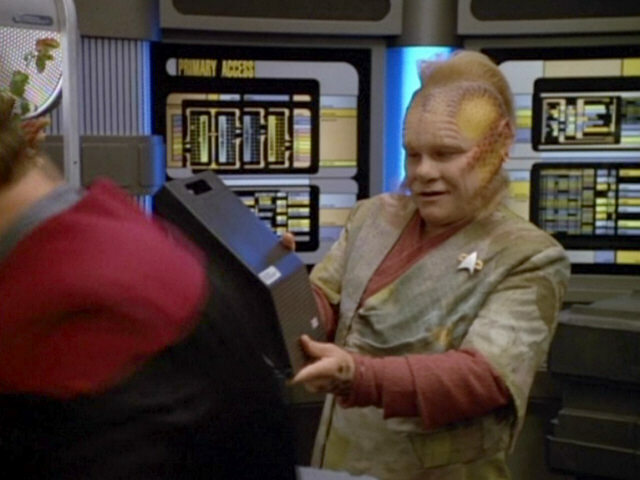 In the VOY episode "Fair Trade", Neelix identifies this case as a "L647X7". 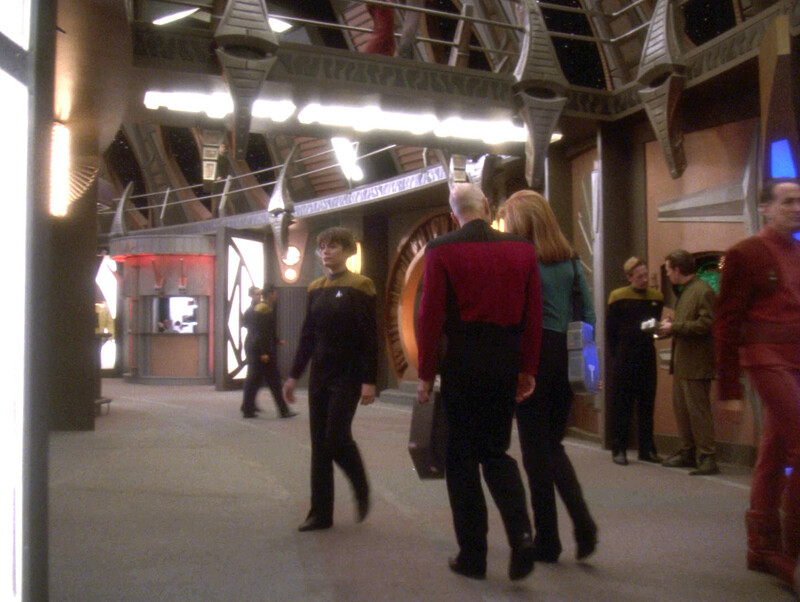 VOY: "Fair Trade" The two shots give us a good impression of the promenade in HD. 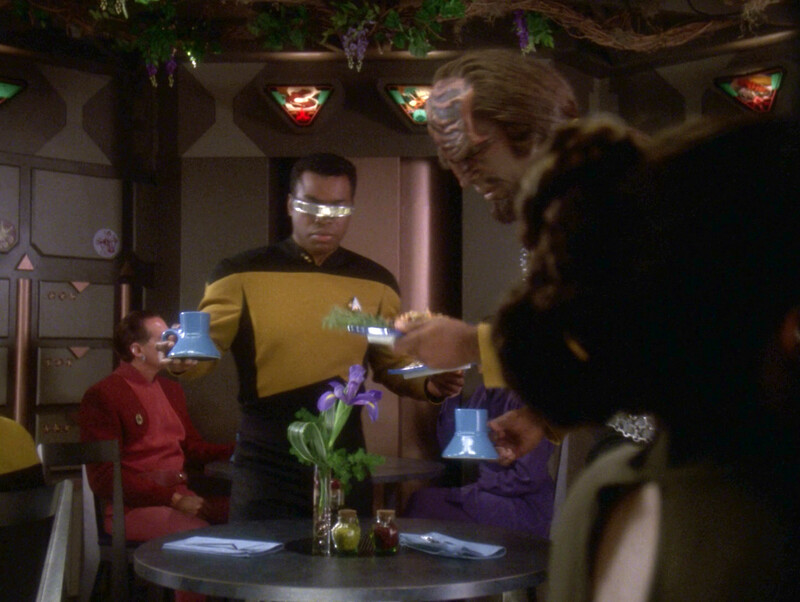 This is Deep Space 9's small café, the replimat. In HD, the alien logos on the three signs at the top of the screenshot can be identified. The first sign displays Klingon food, the second sign Ferengi food and the third sign advertises a Cardassian meal. 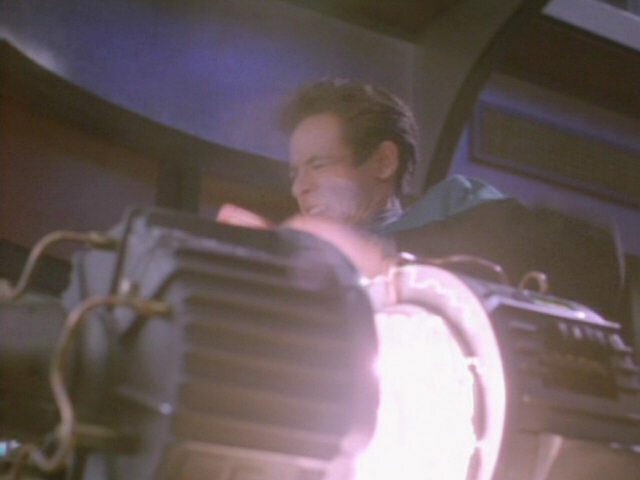 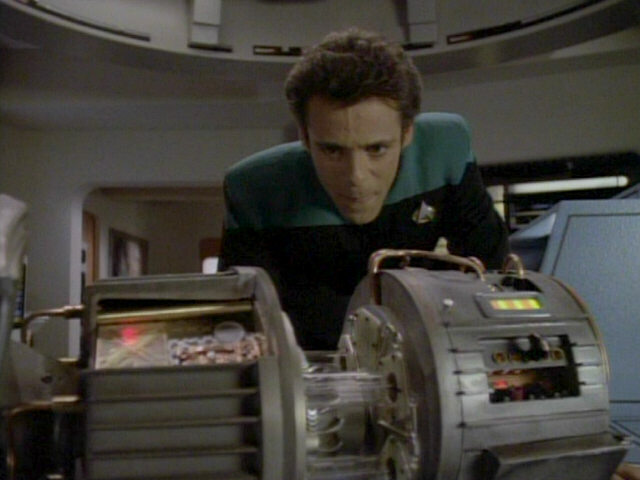 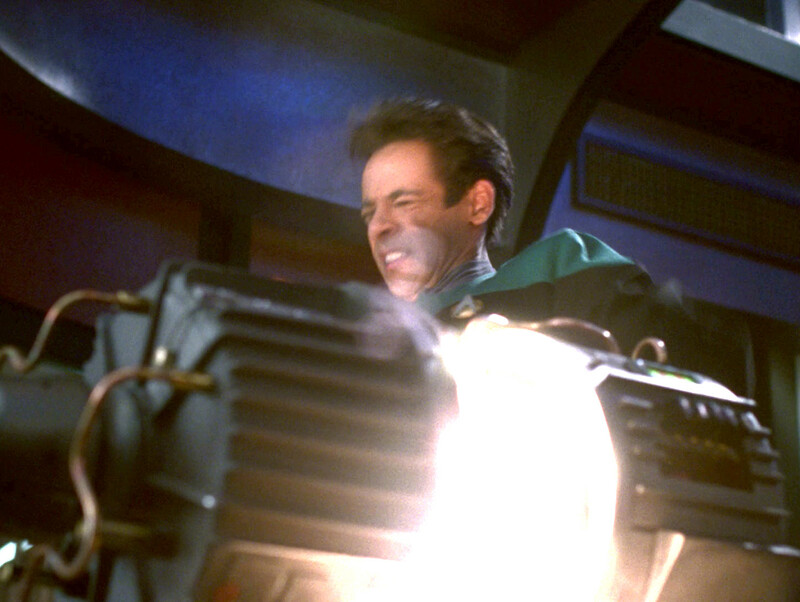 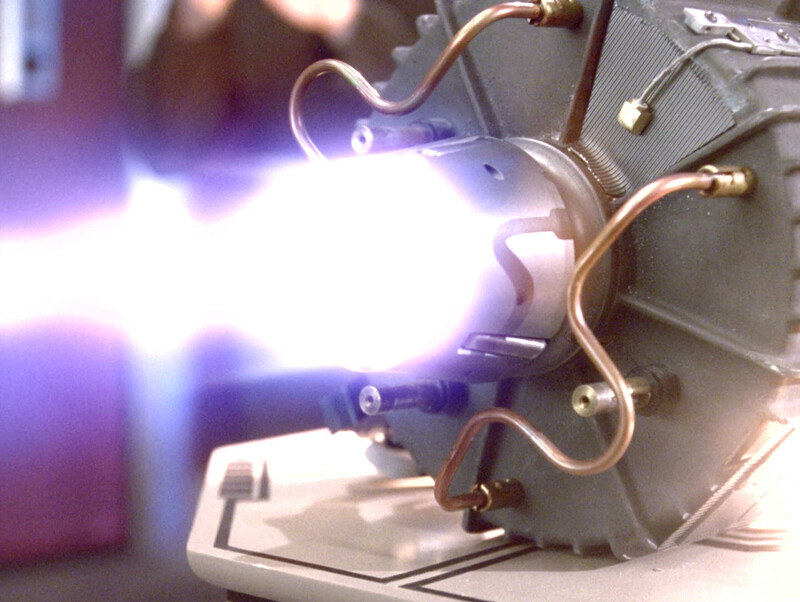 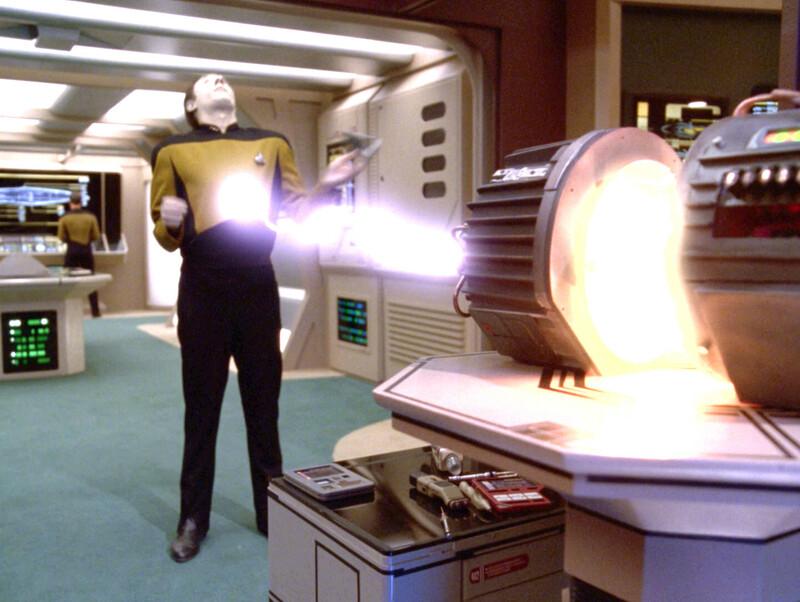 The alien field generator, brought to the USS Enterprise-D by Julian Bashir in this episode, would later turn up as a Starfleet polaron generator in the Voyager episode "Time and Again". 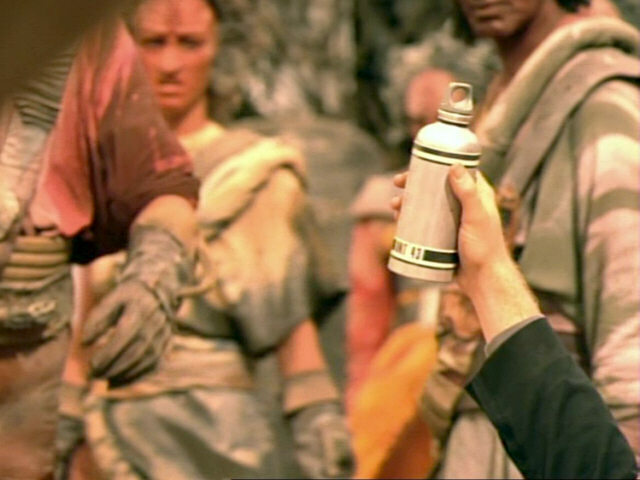 and Again" The prop in HD. 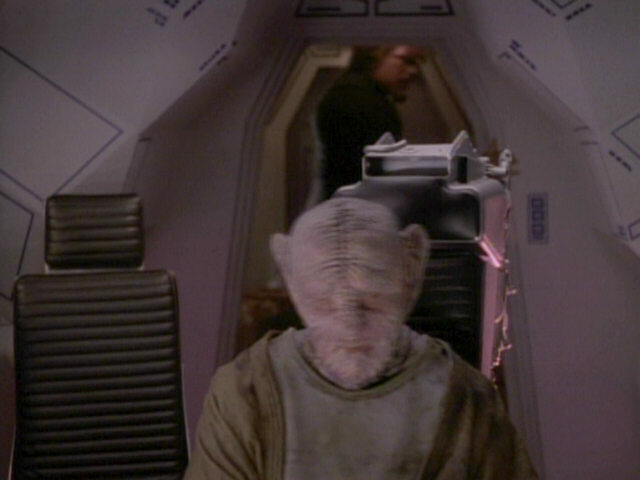 Jaglom Shrek is the first Yridian we ever seen on Star Trek. 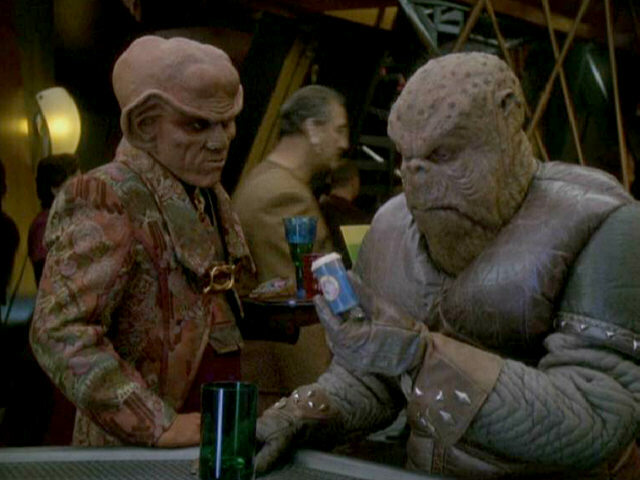 The species would go on to appear in all modern Star Trek series. 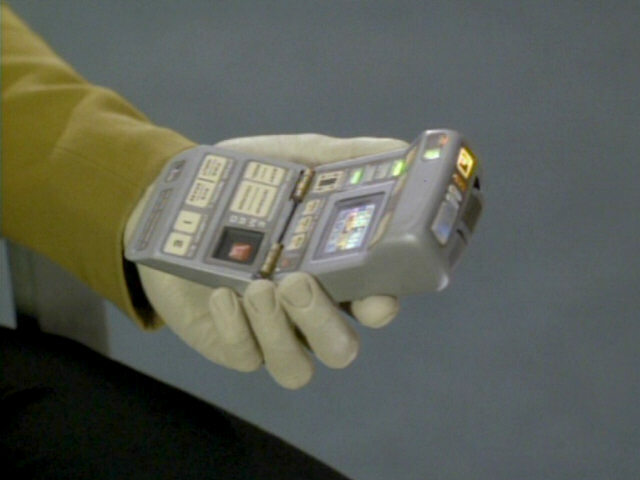 Here, we also get a good look at the characteristic four-fingered Yridian hand, including a fused thumb/index finger. 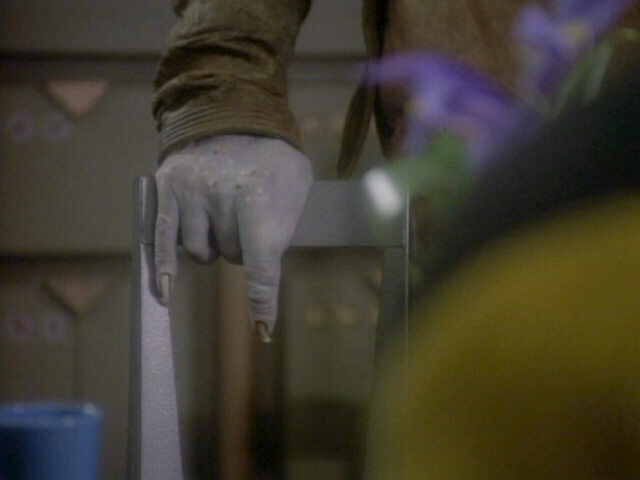 In Alien Hands Shrek's features in HD. 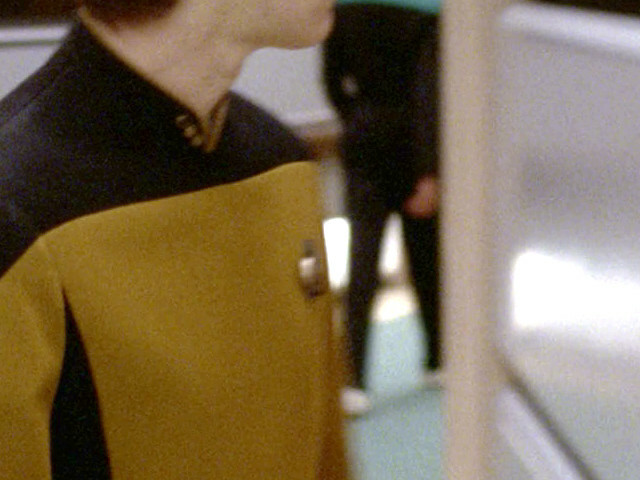 Note the better facial color. 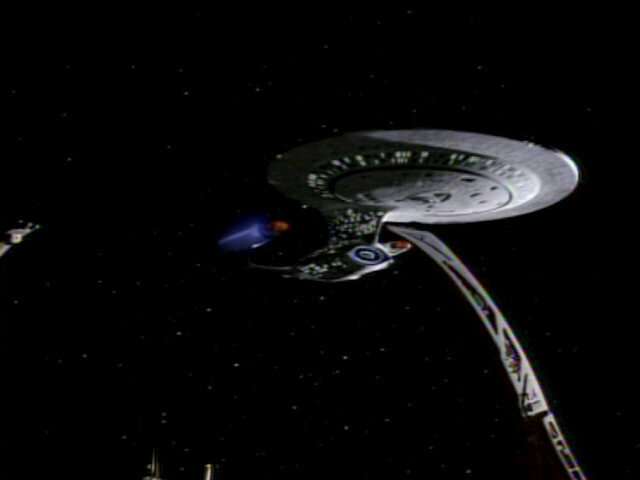 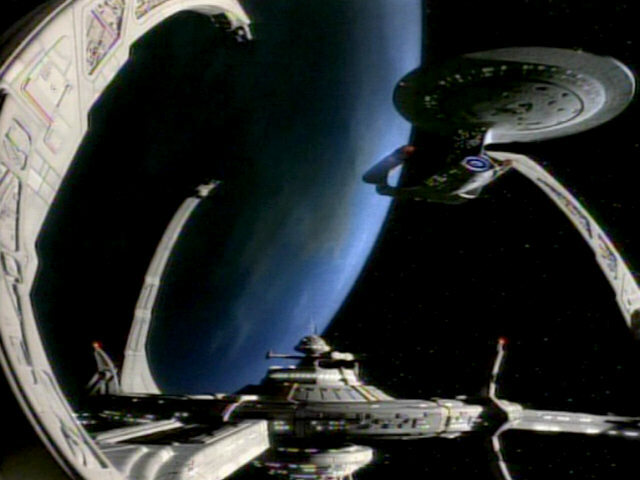 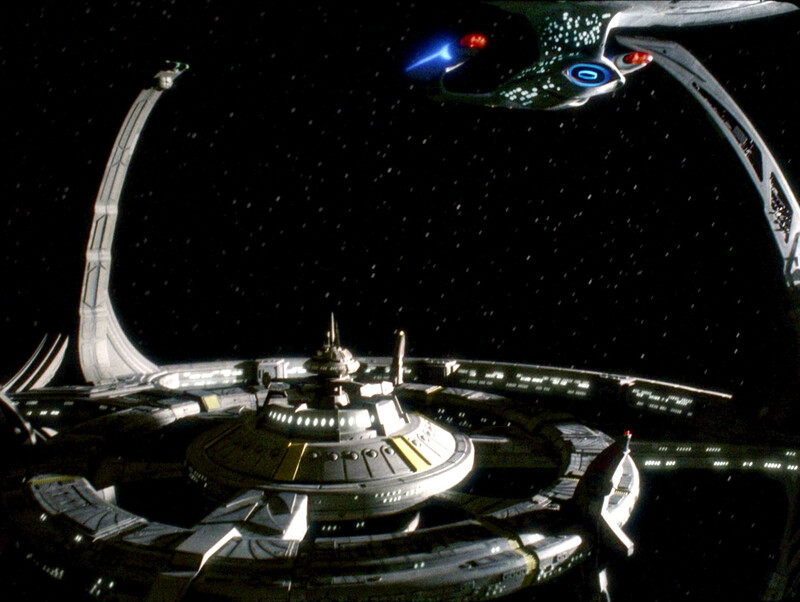 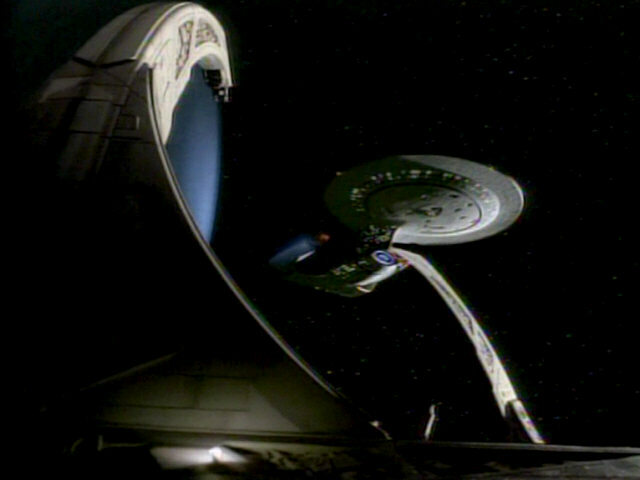 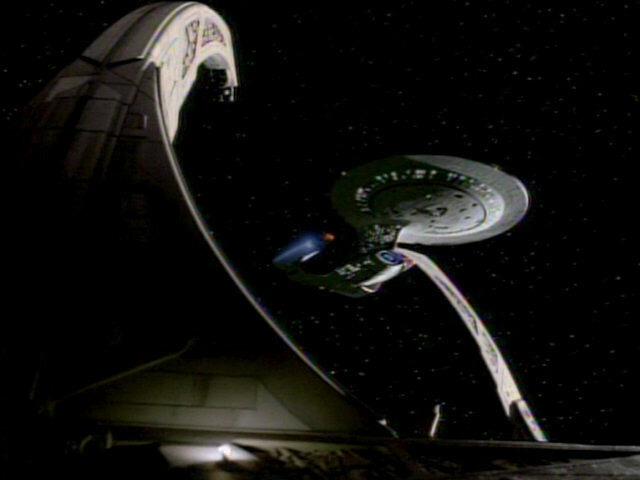 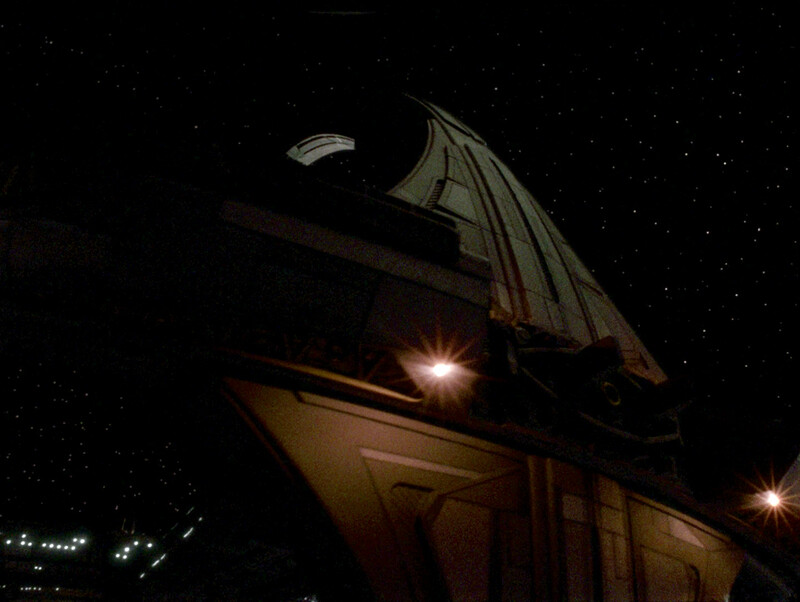 Like the first shot of DS9 and the USS Enterprise-D, this shot was already seen in the DS9 pilot episode "Emissary". 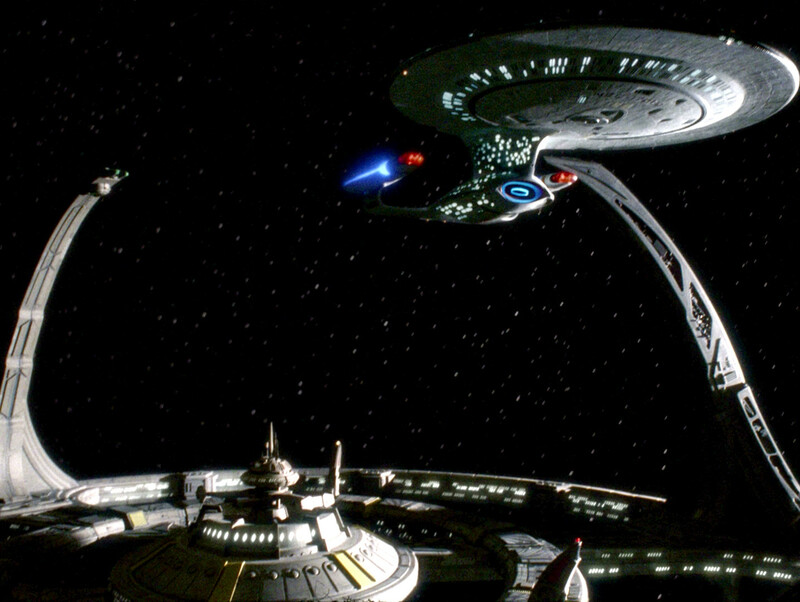 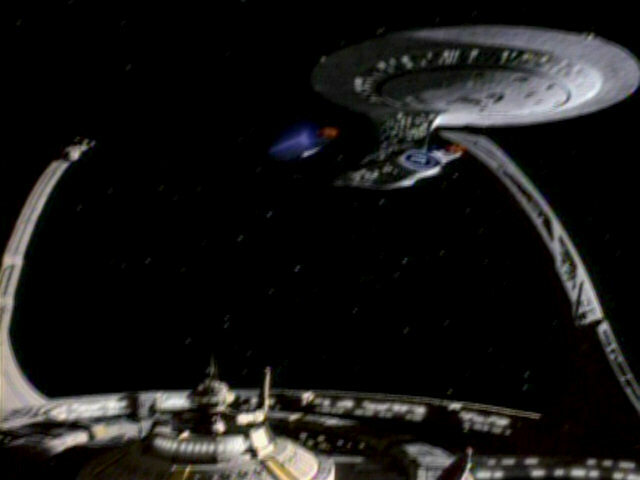 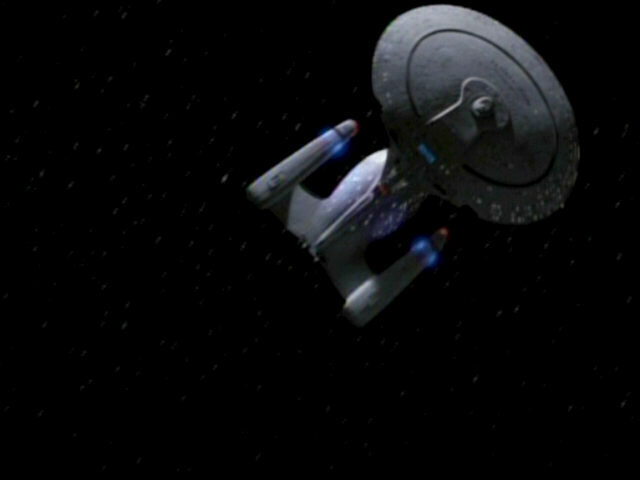 In that episode, the station was still in orbit of Bajor when the station and the Federation ship were shown. 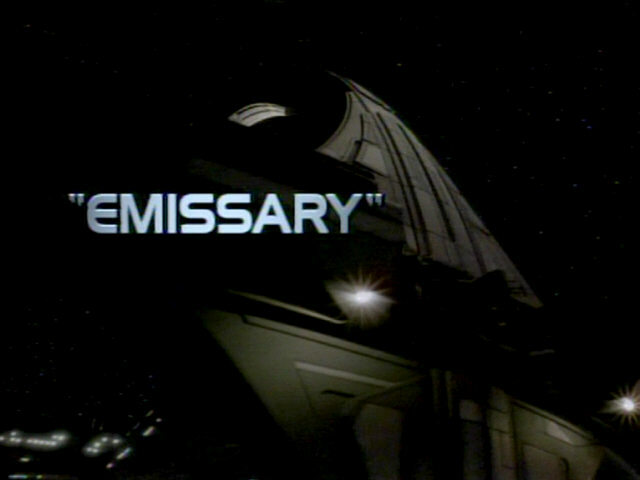 DS9: "Emissary" More shots of the Enterprise and the station in HD. 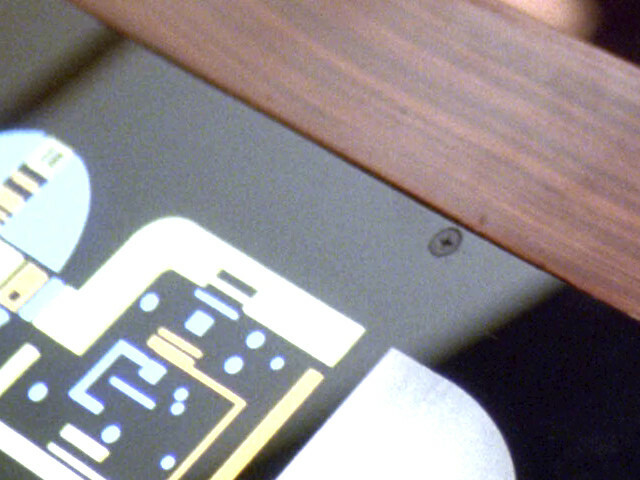 The screw affixing the plexiglass LCARS display to the wooden console frame can clearly be seen. 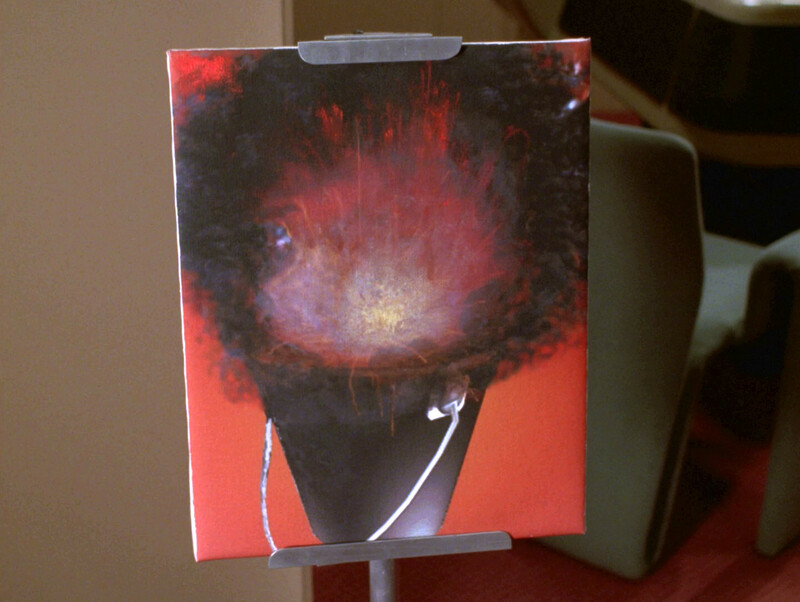 The screw is even more obvious in HD. 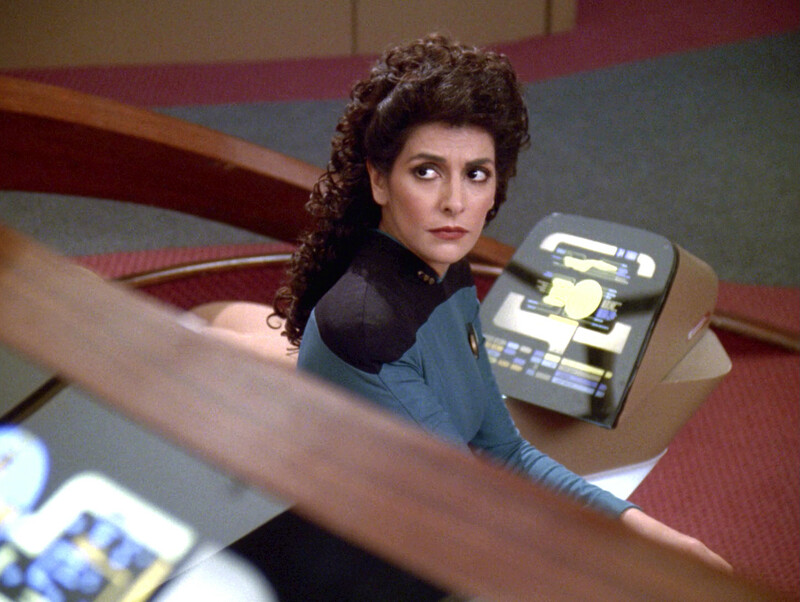 We get a good look at Troi's bridge console in this shot. 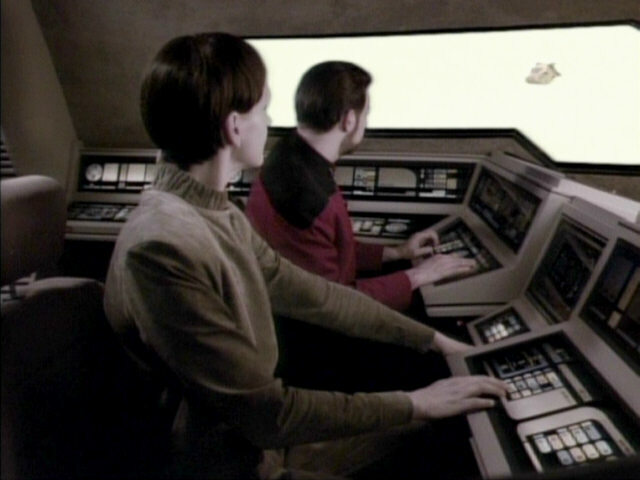 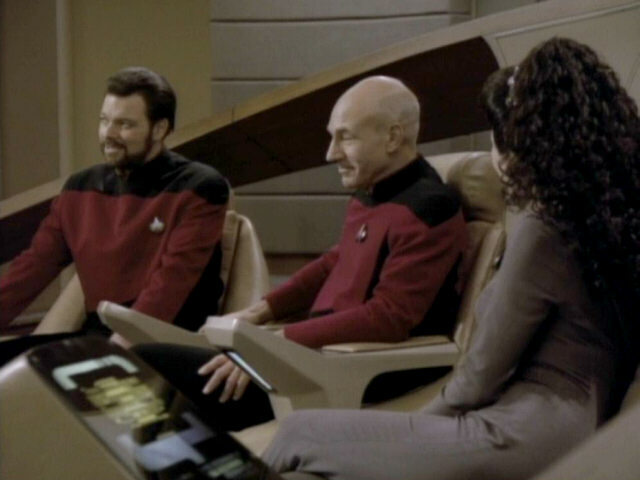 Like the display on Riker's console, the LCARS graphic on Troi's console was replaced late in the fifth season. 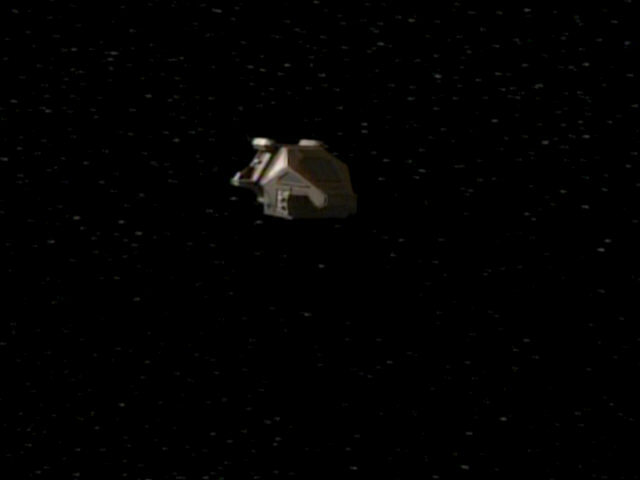 The screenshot from "The First Duty" shows what the original graphic looked like. 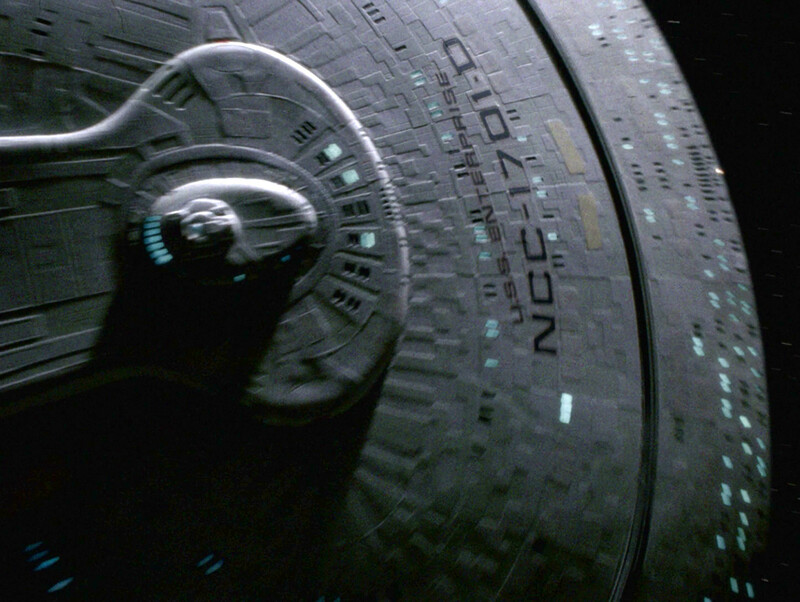 "The First Duty" The monitor in HD. 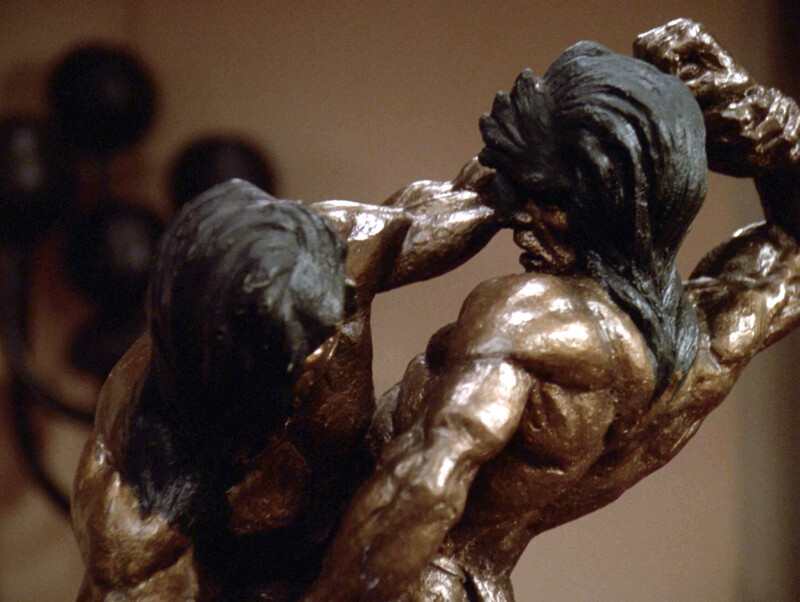 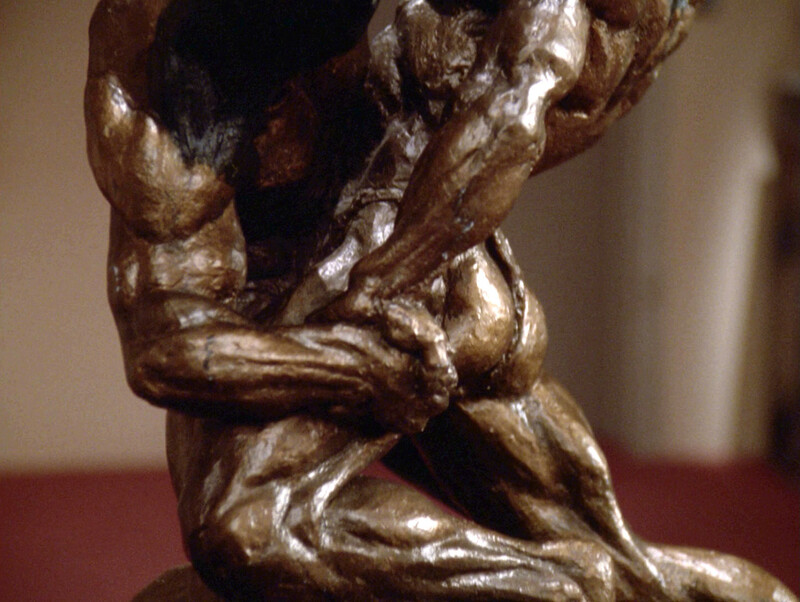 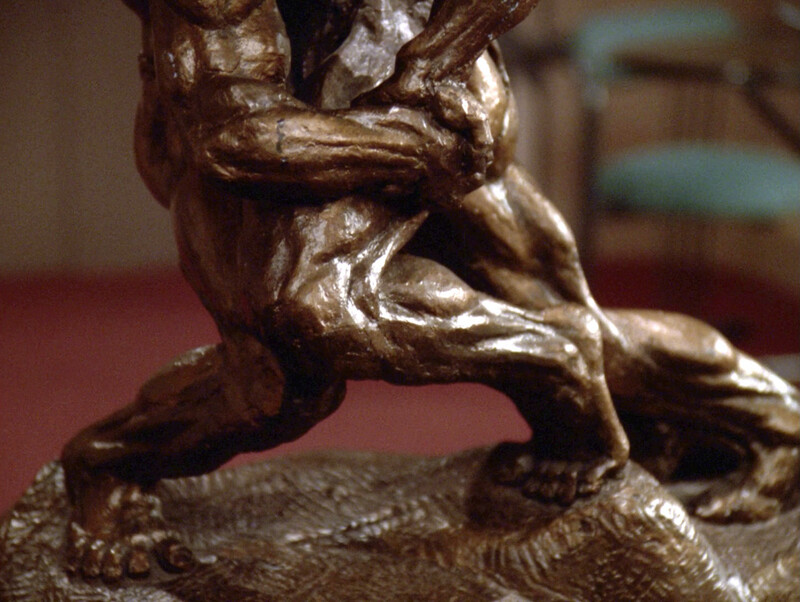 Worf's sculpture of the epic fight between Kahless and Morath is seen up close in this episode. 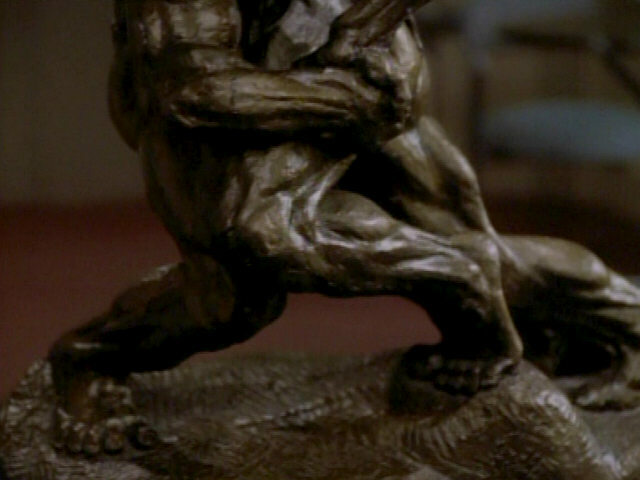 The statue in HD. 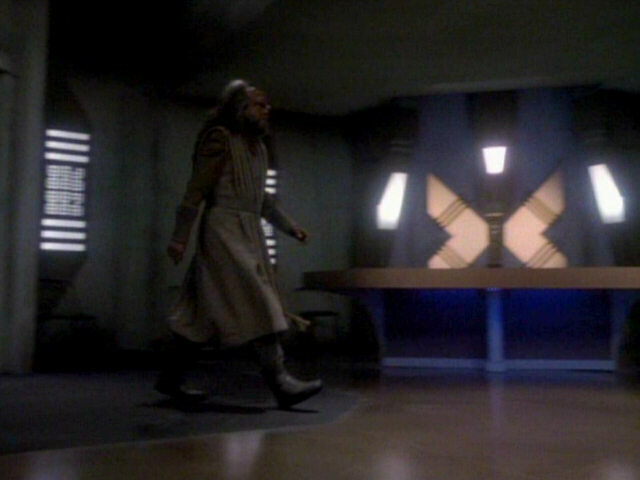 Worf's quarters have not changed much since they were last seen in "A Fistful of Datas". 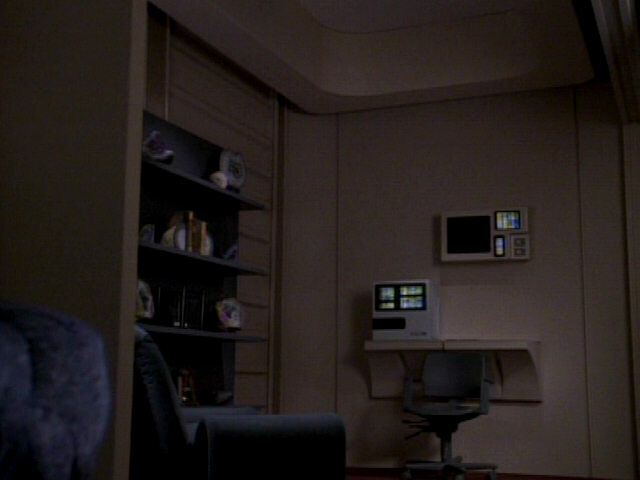 One new addition is the wall-mounted monitor seen in the screenshot. 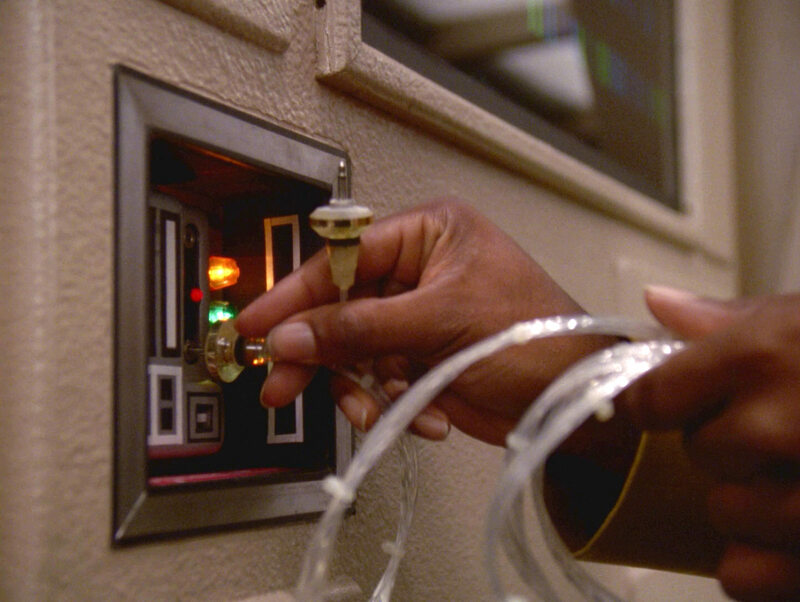 This addition was made for "Aquiel", where the set represented Geordi's quarters. 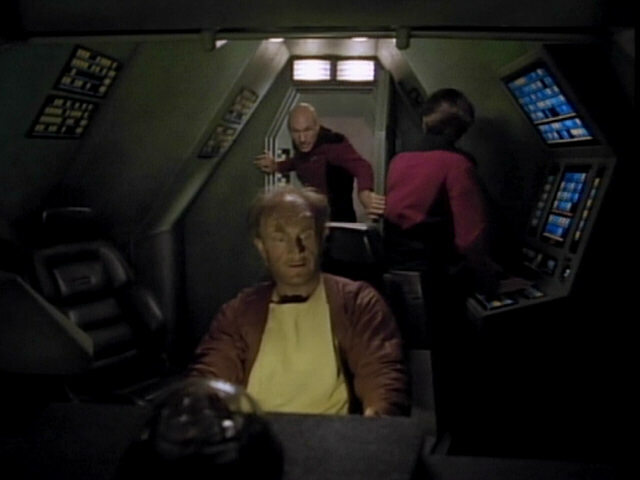 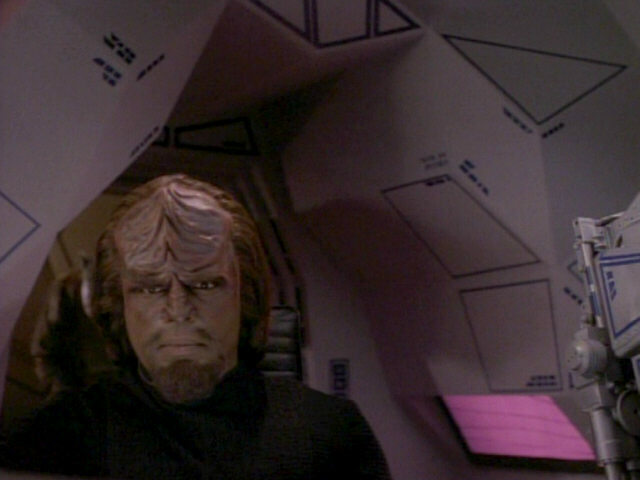 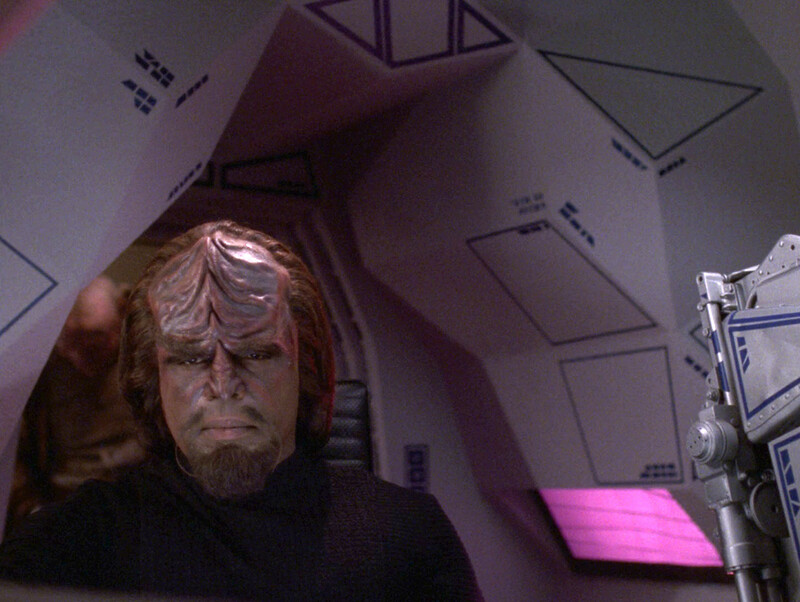 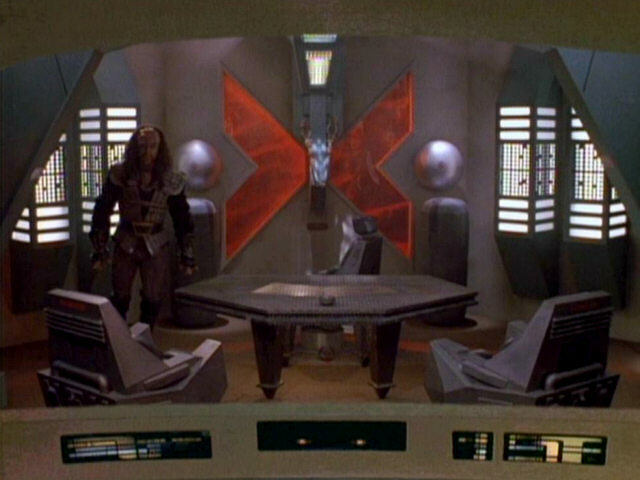 In Worf's quarters, the monitor hangs a little lower, though. 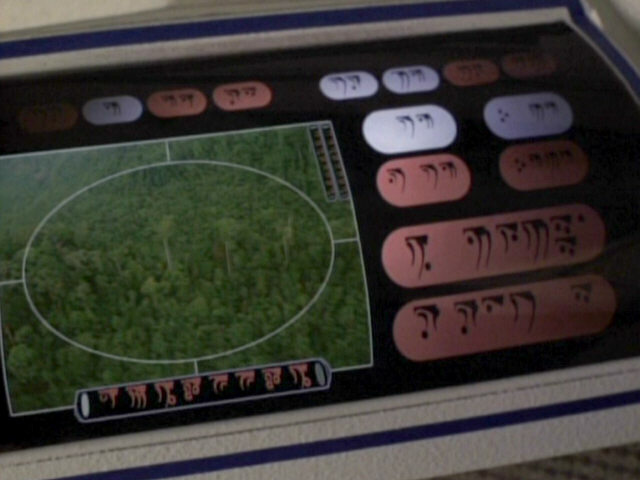 "Aquiel" A close-up of the console in HD. 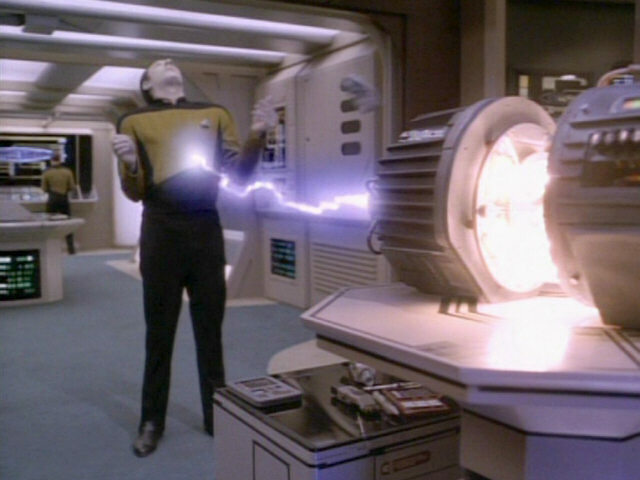 The alien field generator powers up and fires an energy beam at Data. 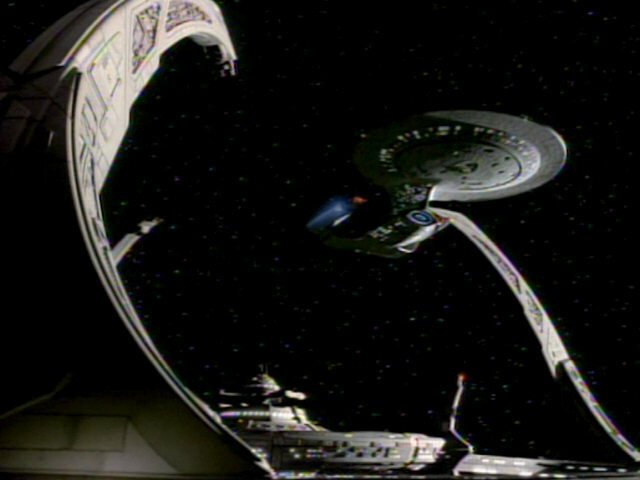 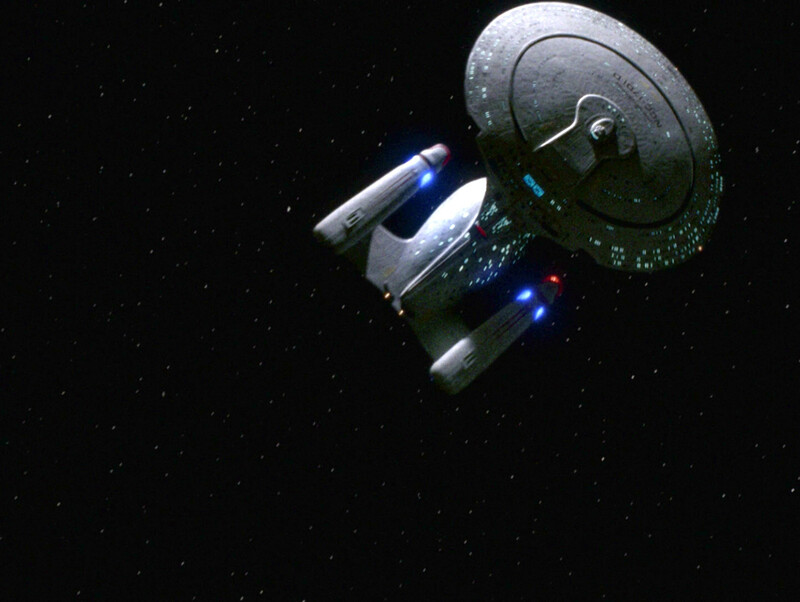 The arc was reconstructed for TNG-R and looks less defined and brighter now. 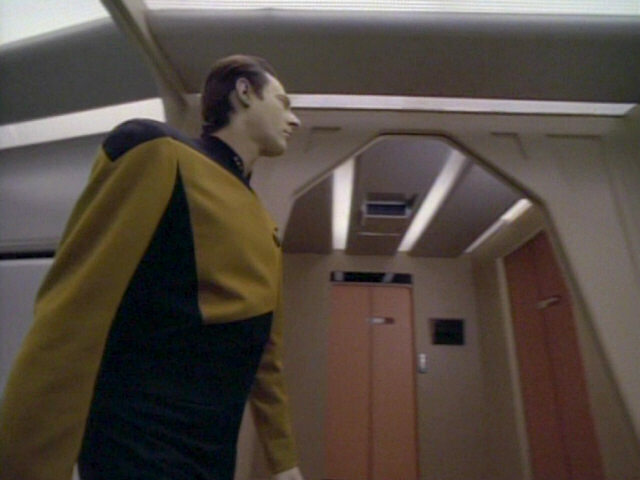 The door to the right of the turbolift door in the small alcove seen behind Data leads to the chief engineer's office in main engineering. 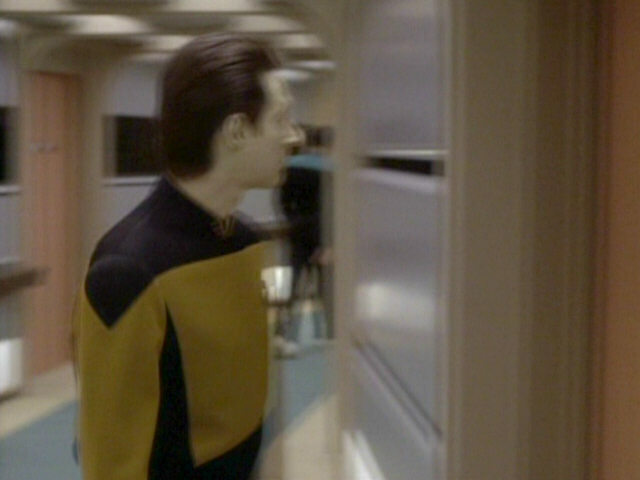 The other side of the door can be seen in the right half of the screenshot from earlier in the episode. 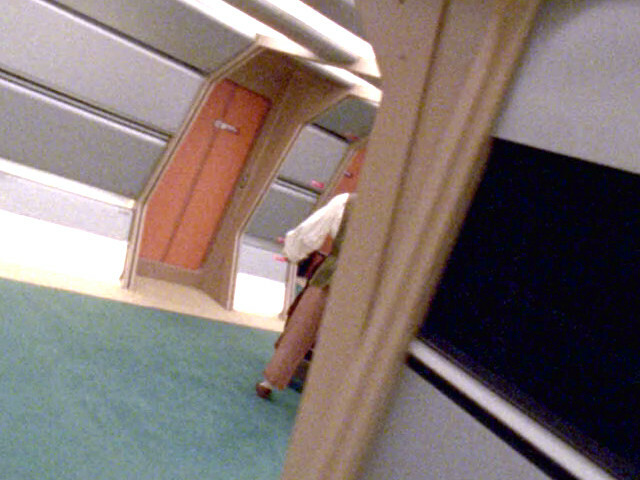 Like in many episodes, the outer main engineering isolation door (also seen in the screenshot from "The Best of Both Worlds I") has come down to hide the fact that the large corridor lounge is actually a redress of parts of the main engineering set. 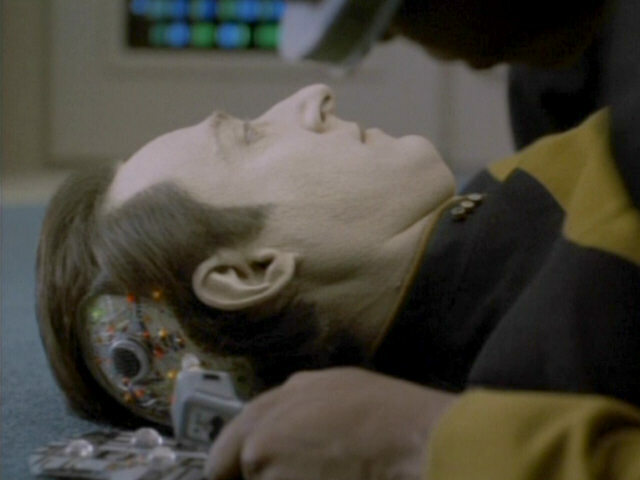 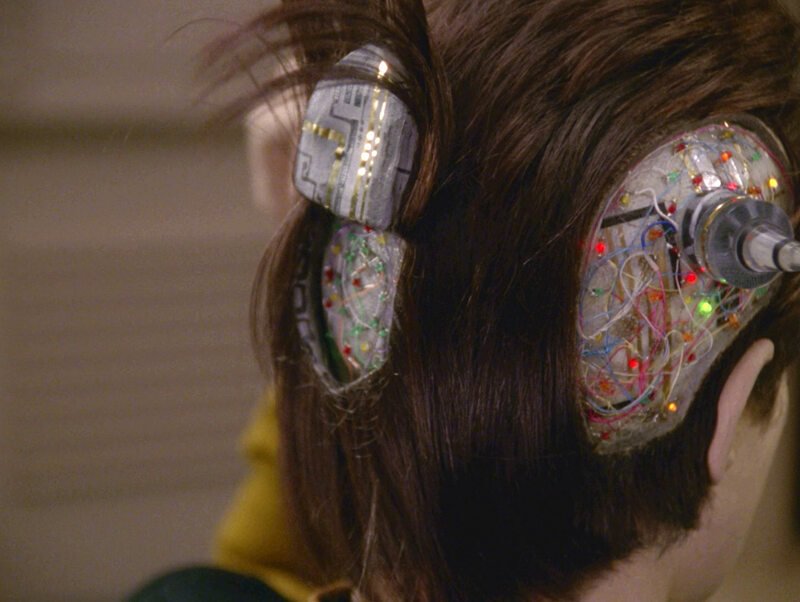 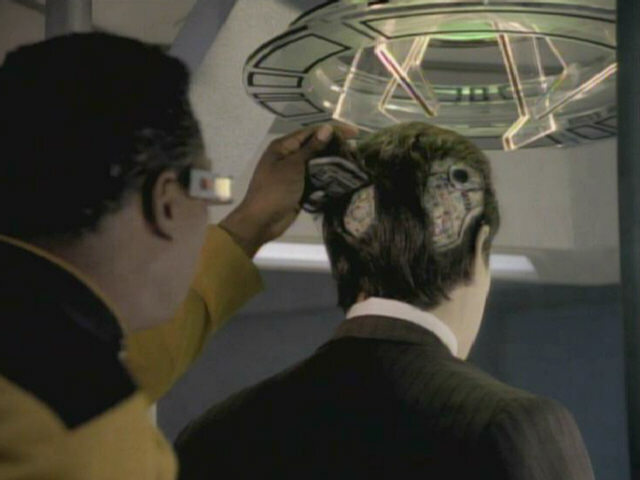 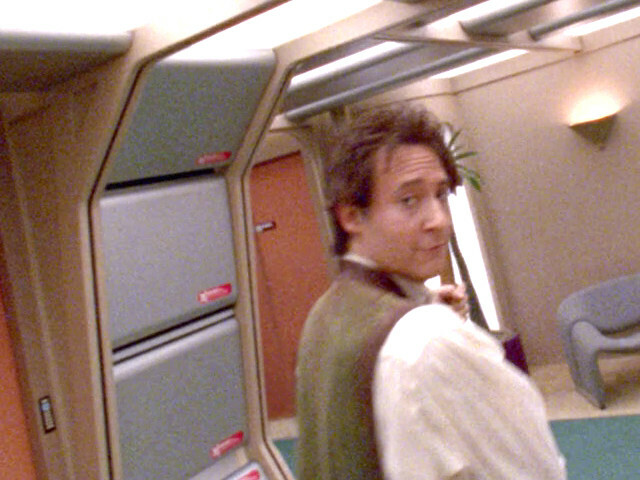 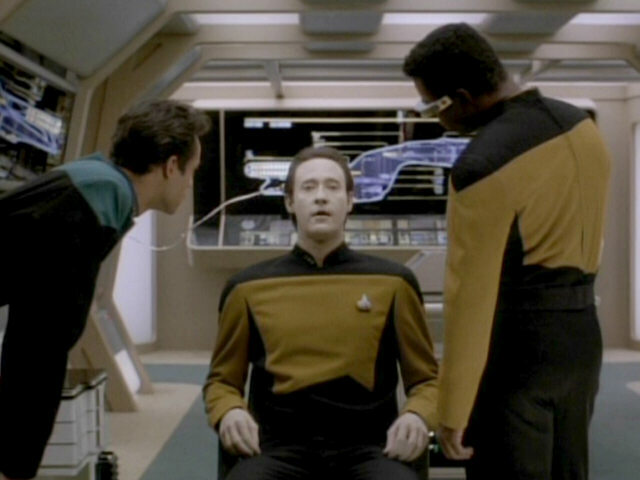 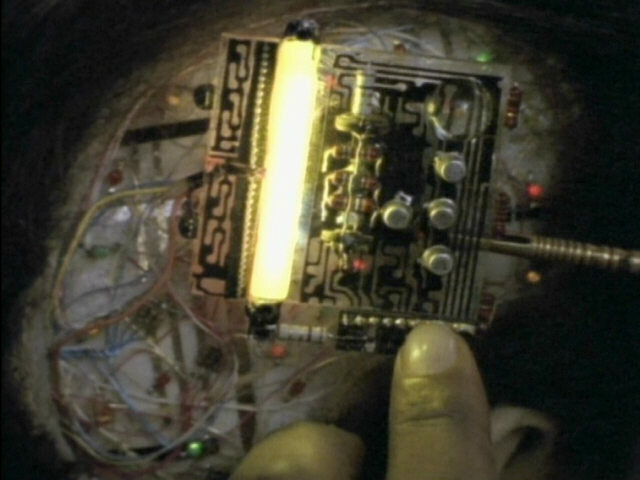 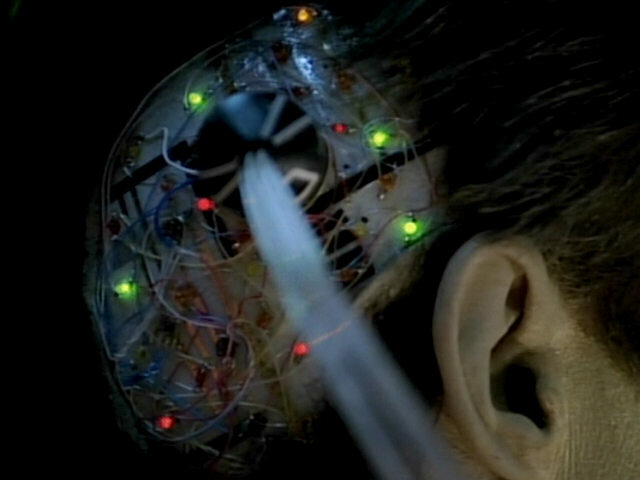 "Birthright I" is one of several episodes in which parts of Data's skull are exposed. 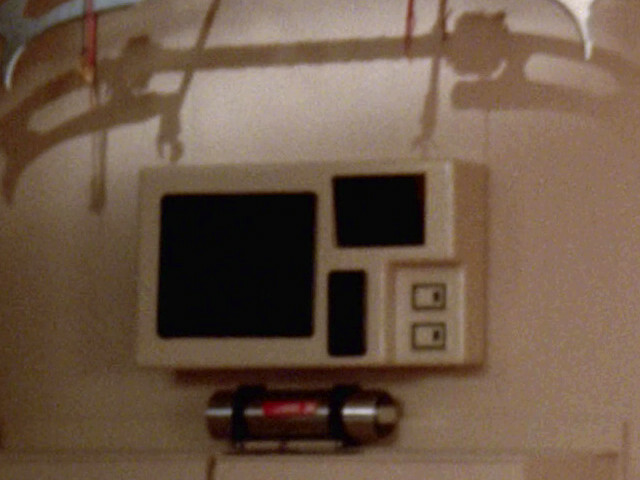 The same make-up appliance appears in "The Best of Both Worlds II", "Clues", "Disaster", "Cause and Effect", "Time's Arrow II" and "A Fistful of Datas". 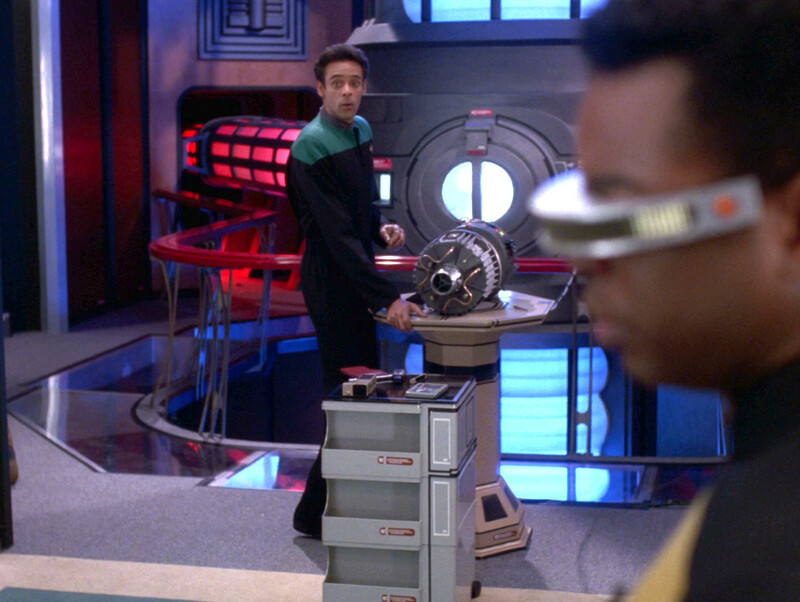 In this episode, we also get a good look at the hatch which normally covers the circuitry. 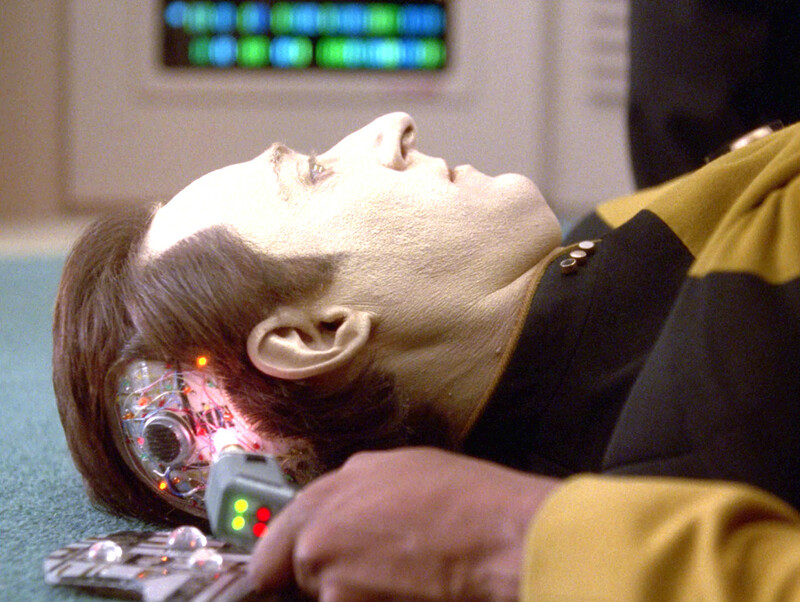 and Effect" Data's opened head in HD. 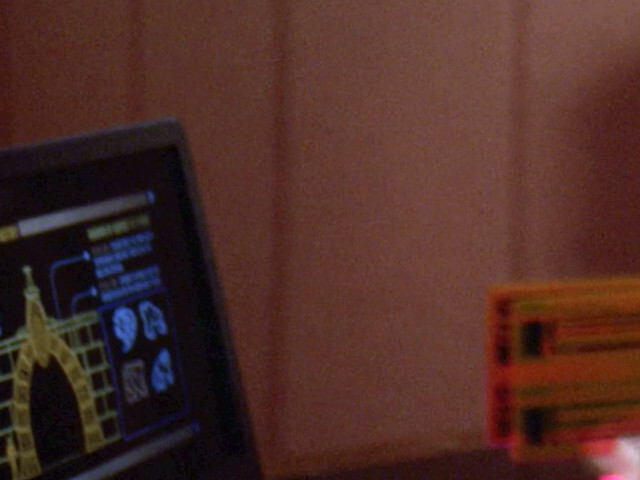 It seems Brent Spiner touched the pyramid game in front of him between takes and some of his body make-up came off, as white fingerprints can clearly be seen on the reflective surface of the toy. 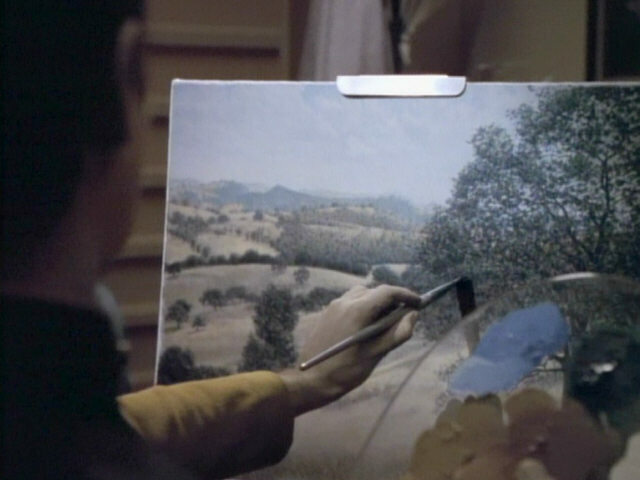 We can see the fingerprints even better in HD. 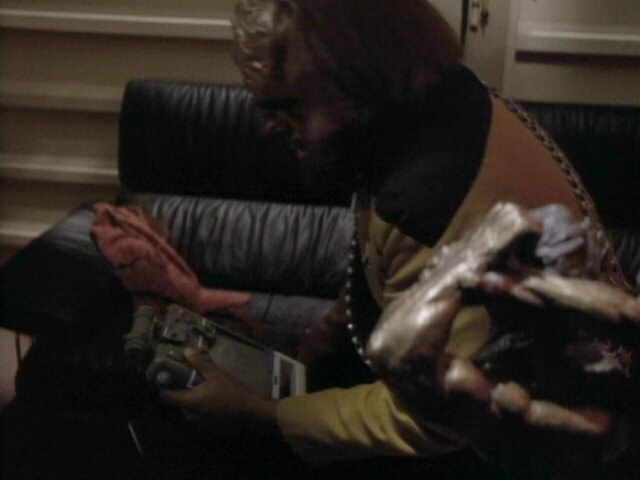 The female Starfleet officer in front of Worf is seen carrying a prop that was used by Alexander as a toy in "A Fistful of Datas". 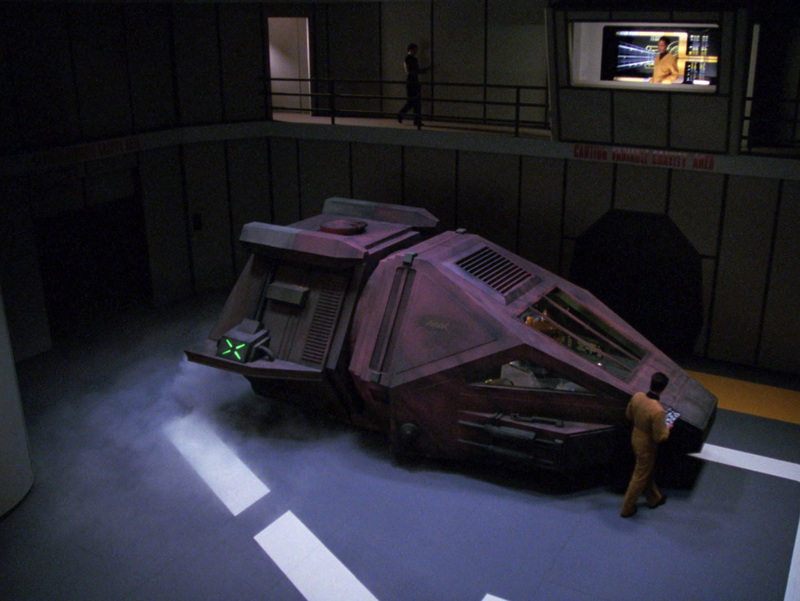 Before that, the prop was also seen on Moab IV in "The Masterpiece Society", in Worf's quarters in "New Ground" and will also be seen on Tilonus IV in "Frame of Mind". 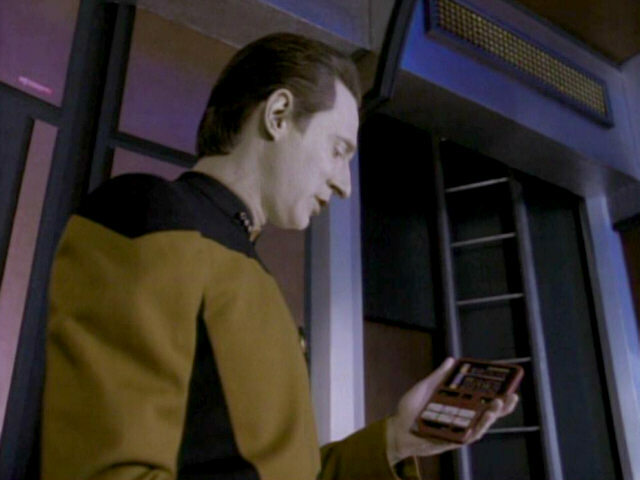 The prop includes three 5¼-inch floppy disk drive covers. 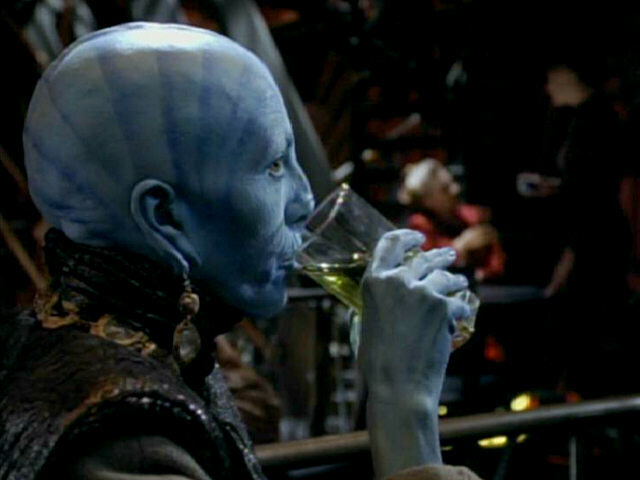 Resident barfly Morn makes an appearance in this scene. 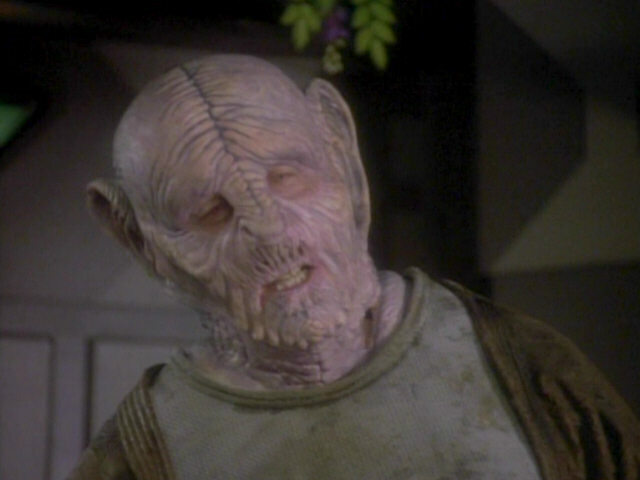 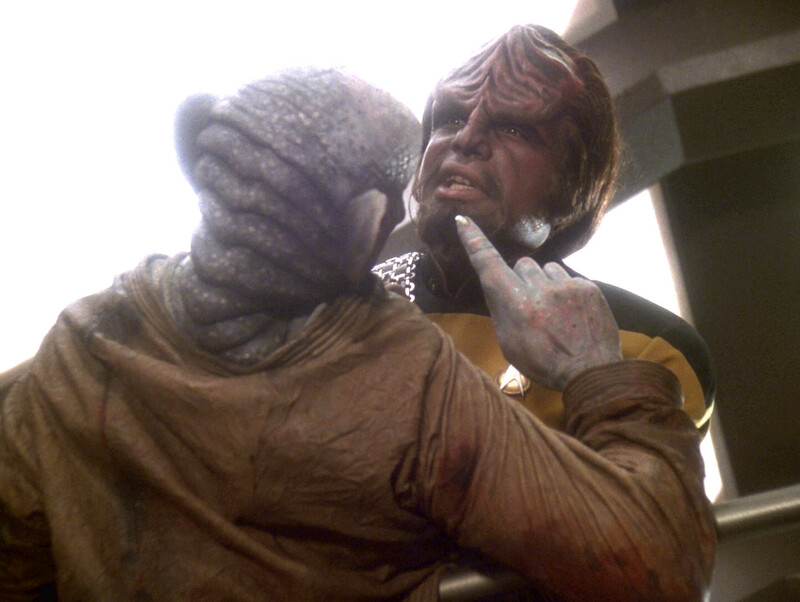 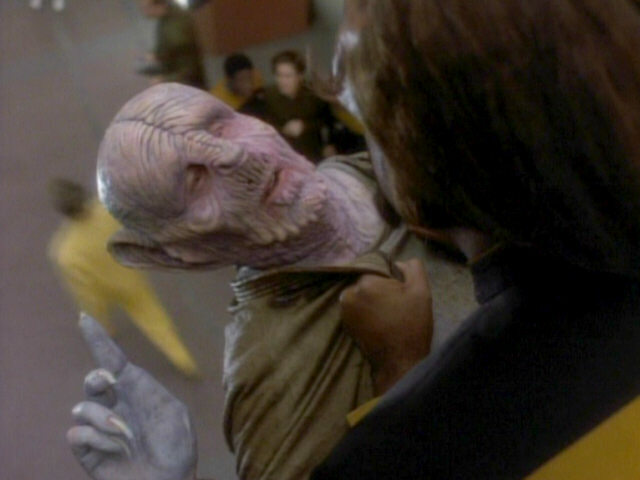 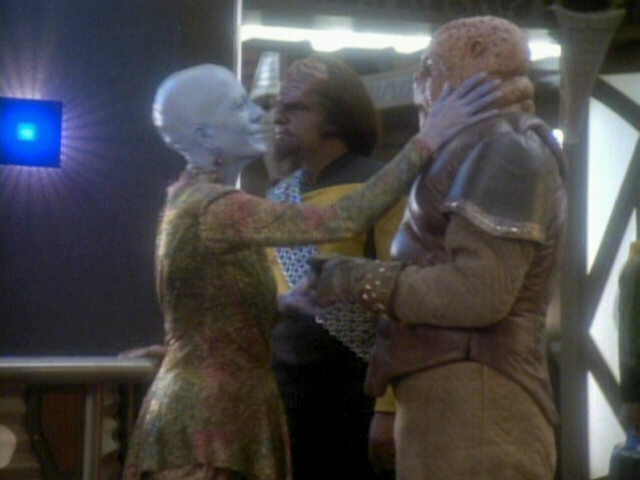 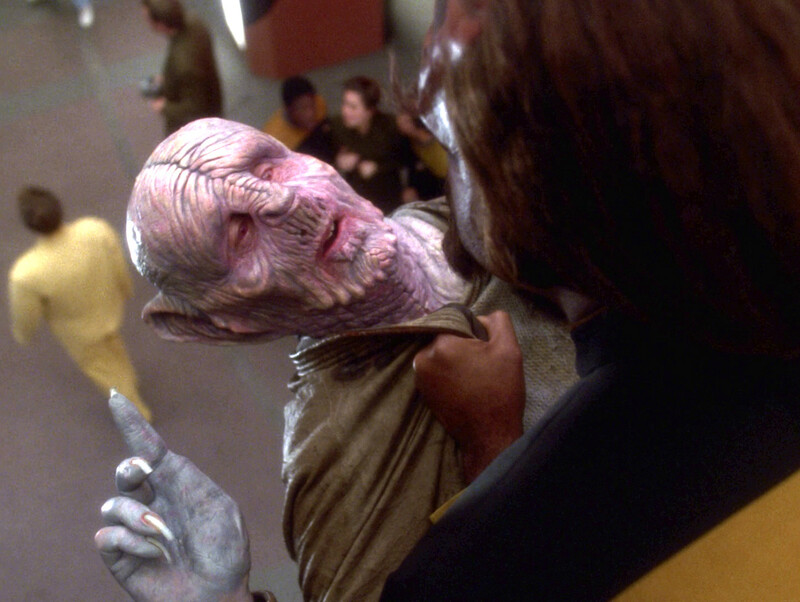 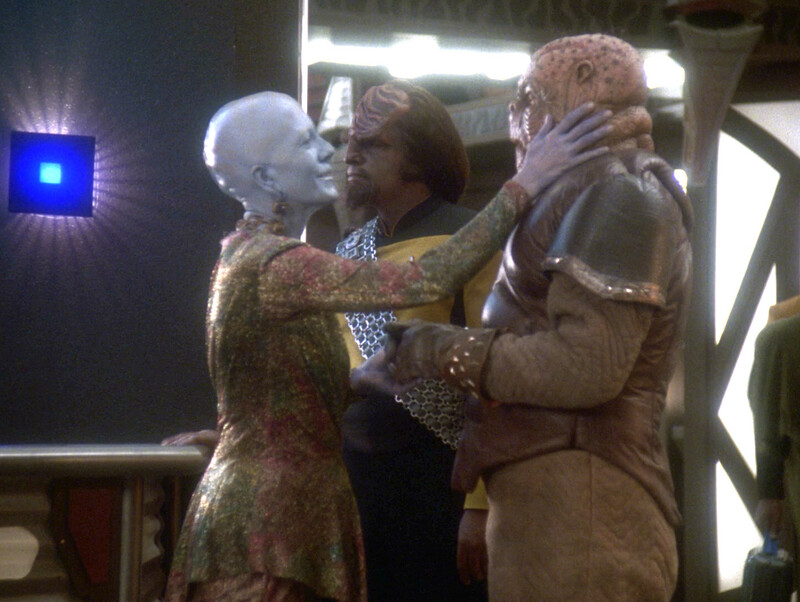 The Bolian woman gently caressing him is also seen in several DS9 episodes, including "Shadowplay". 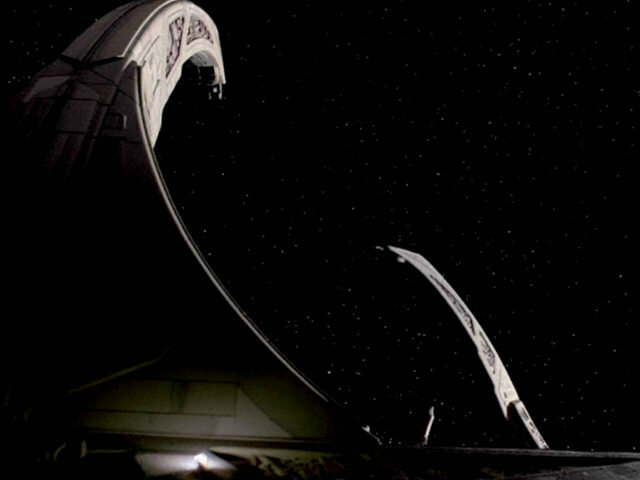 Leave Behind" The aliens in HD. These two shots make it clear that Yridians don't possess a thumb. 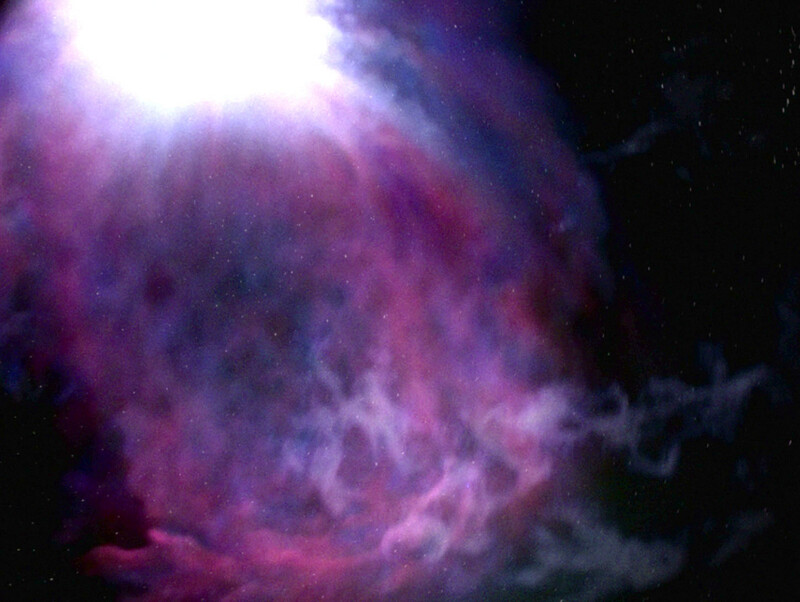 Shrek's hand in HD. 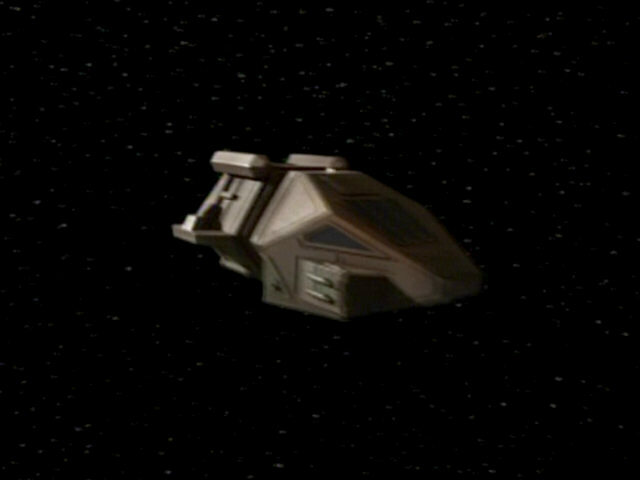 The Yridian shuttle is a re-use of the Nenebek from "Final Mission", which was previously re-used as the J'naii shuttle Taris Murn in "The Outcast". 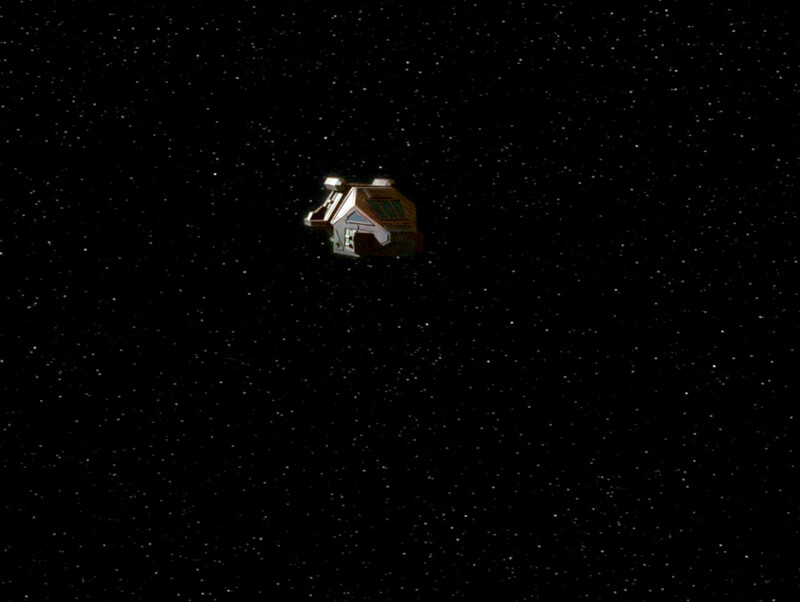 HD The shuttle fly-by in HD. 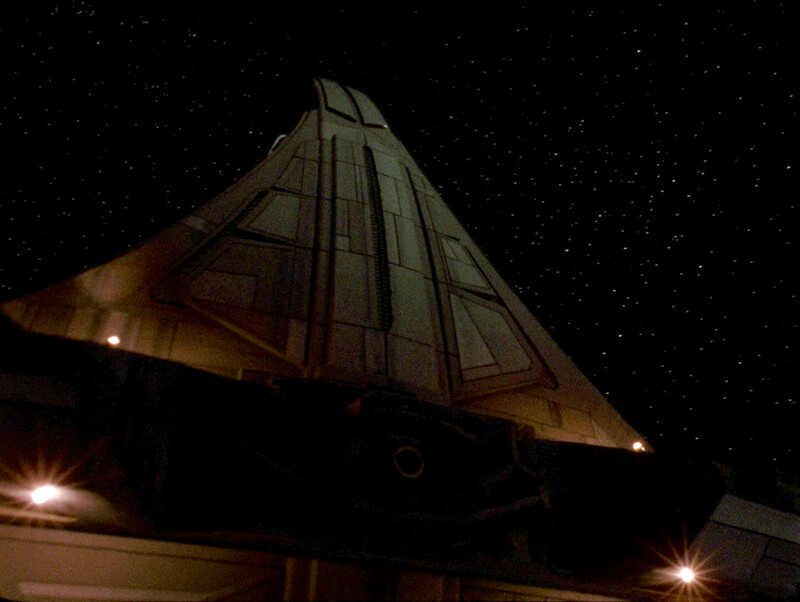 Likewise, the interior of the shuttle is also a re-use of the Nenebek cockpit, including the aft section. 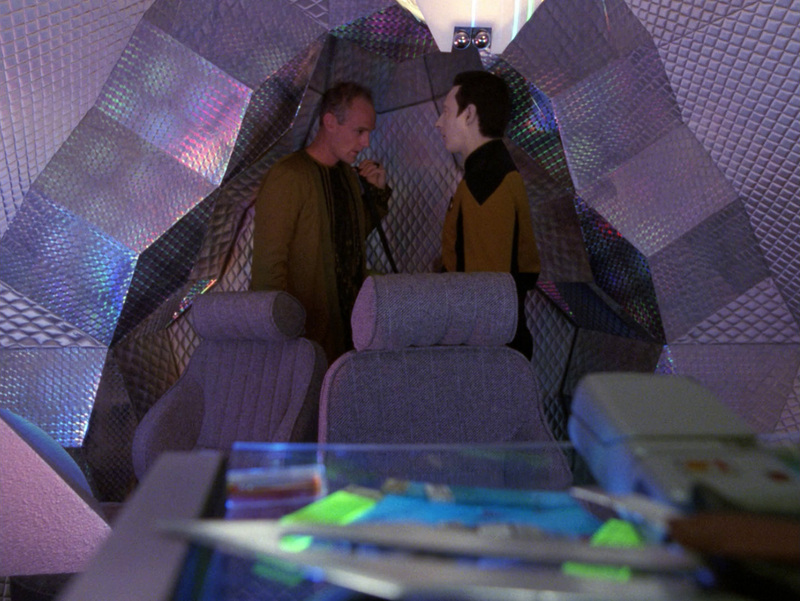 In between, the set had been heavily redressed and seen as Berlinghoff Rasmussen's time-pod in "A Matter of Time". 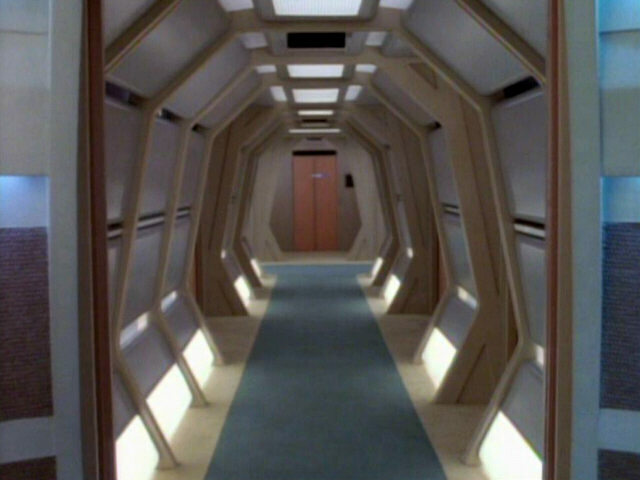 "Final Mission" The interior of the shuttle in HD. 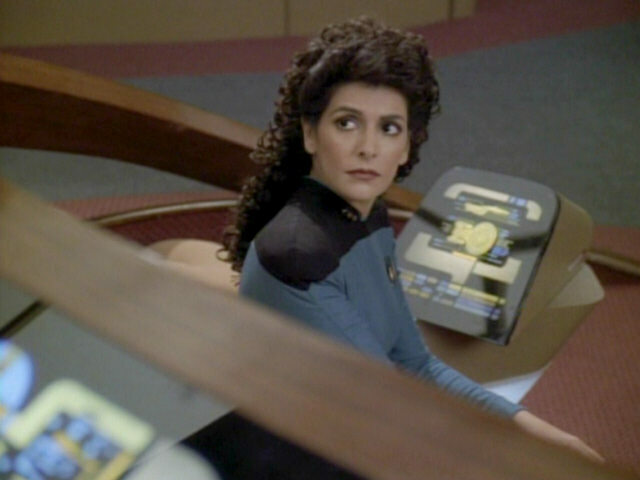 Yiridian writing will be seen again aboard the Yridian ship in "Firstborn". 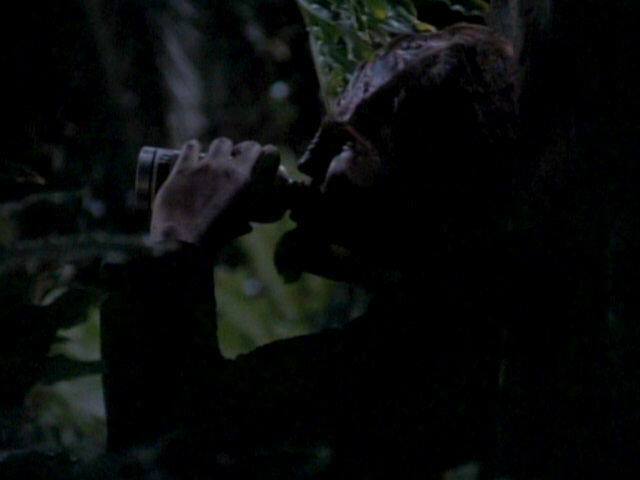 "Firstborn" When the episode was remastered, the footage of the jungles on Carraya IV was replaced by new, different footage. 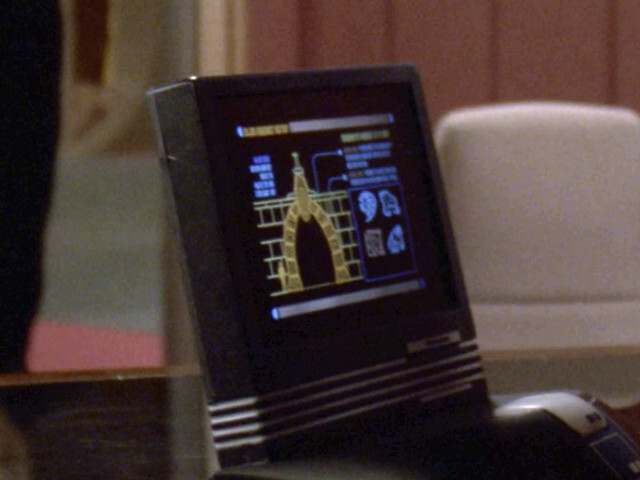 Picard's desktop monitor displays a graphic of a Bajoran aqueduct. 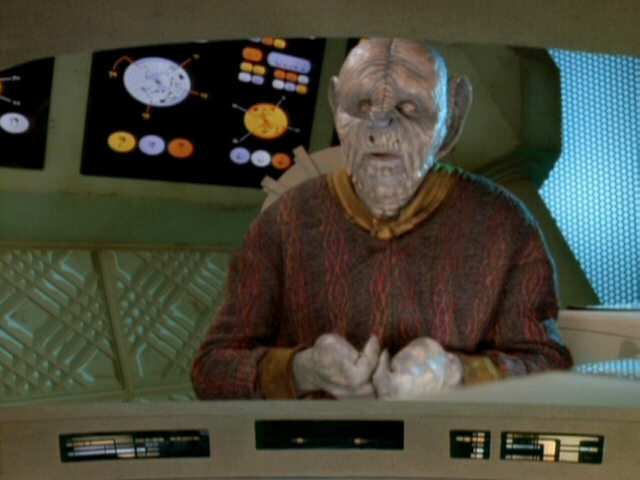 Storyteller" In HD, the four Bajoran letters can clearly be made out on the right half of the screen. 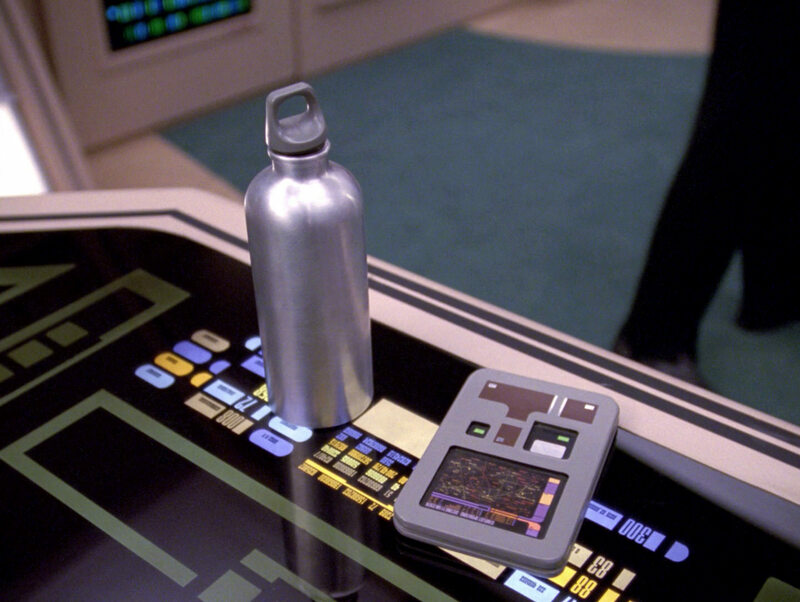 Barclay used a similar water bottle in "Realm of Fear". 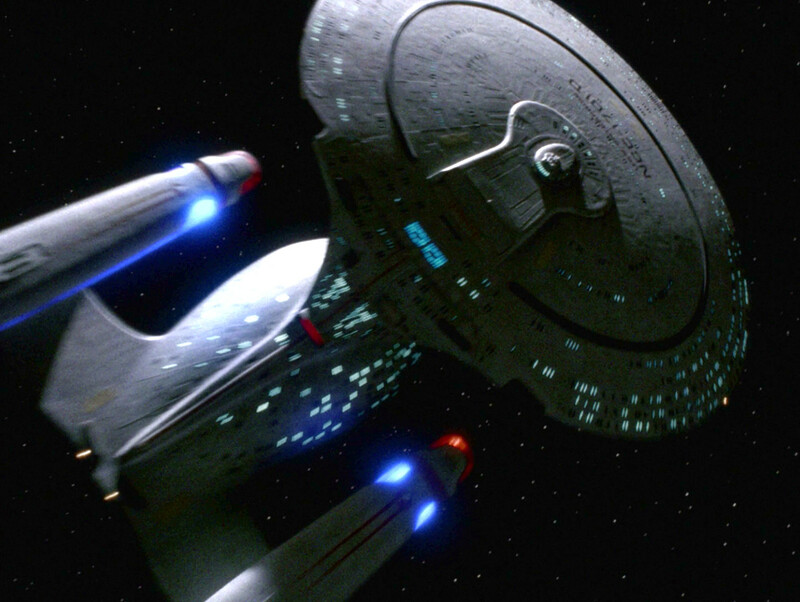 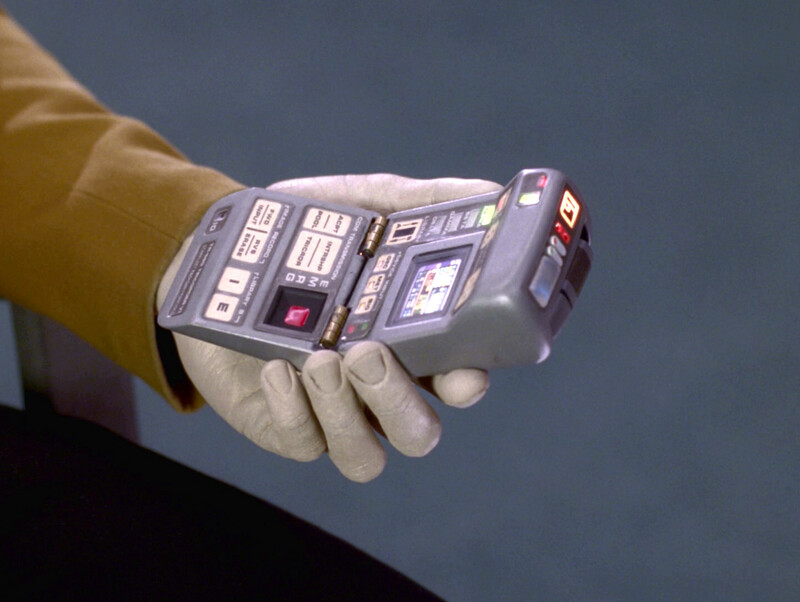 For this appearance, the prop was Starfleet-ized with added stripes and numbers. 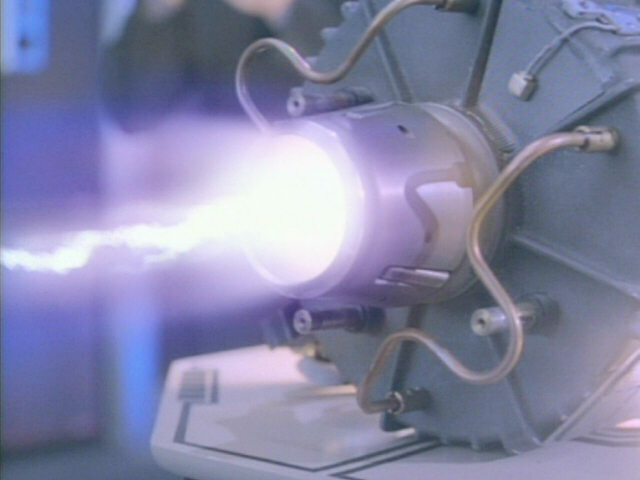 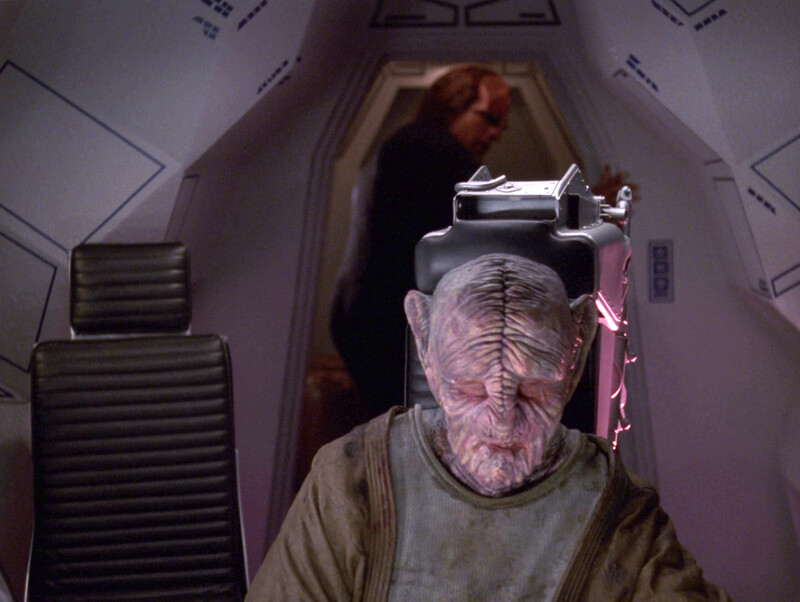 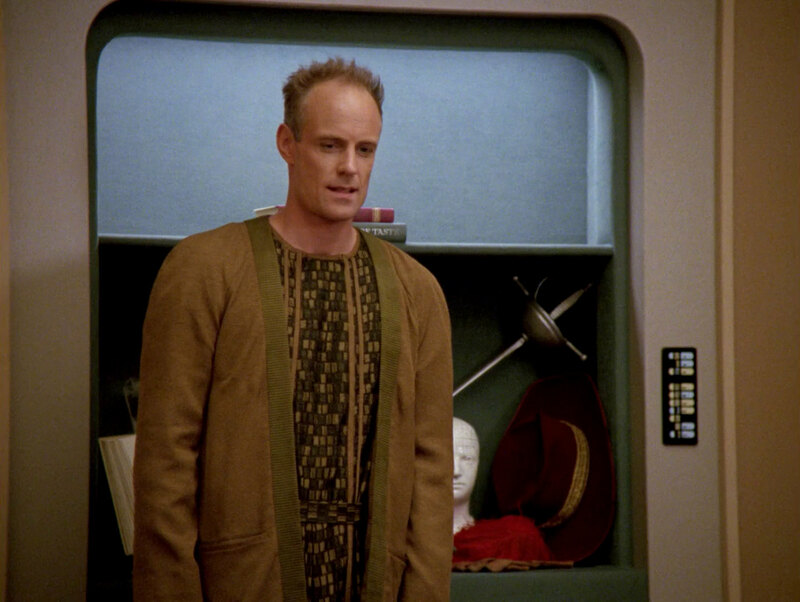 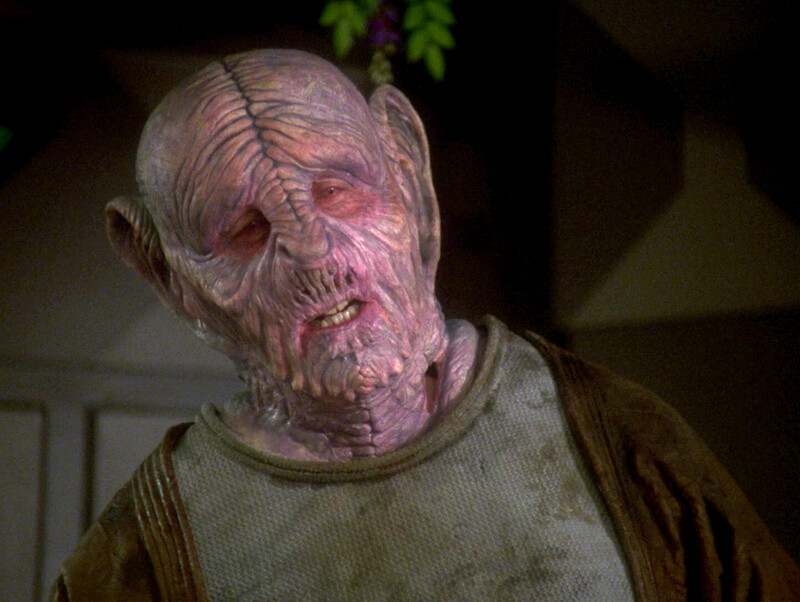 The same prop later appeared in the VOY pilot episode "Caretaker". 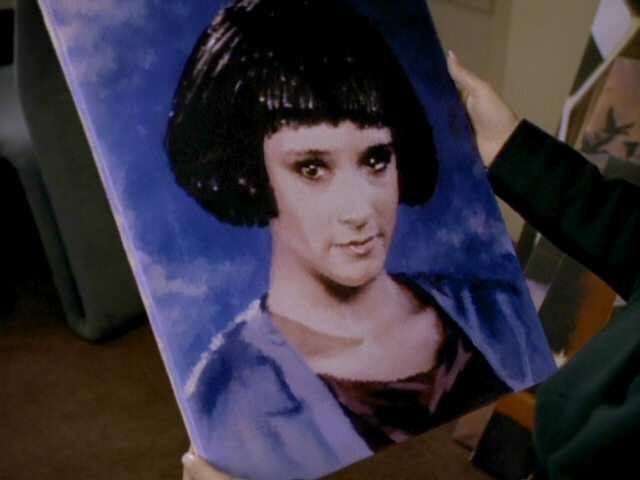 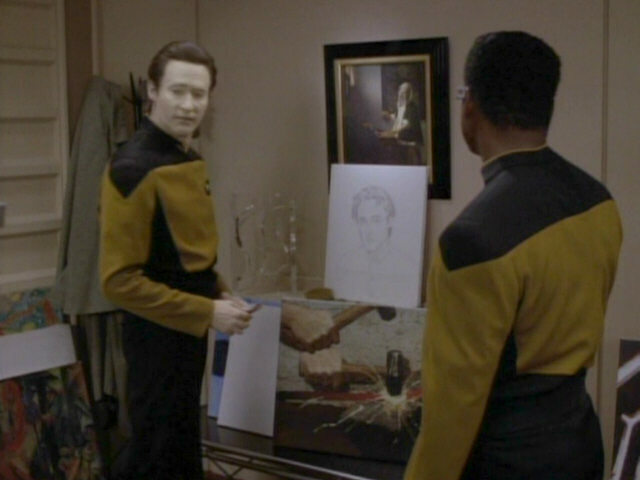 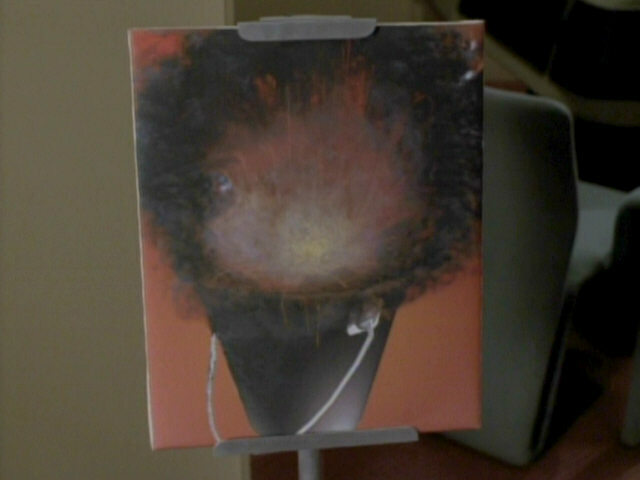 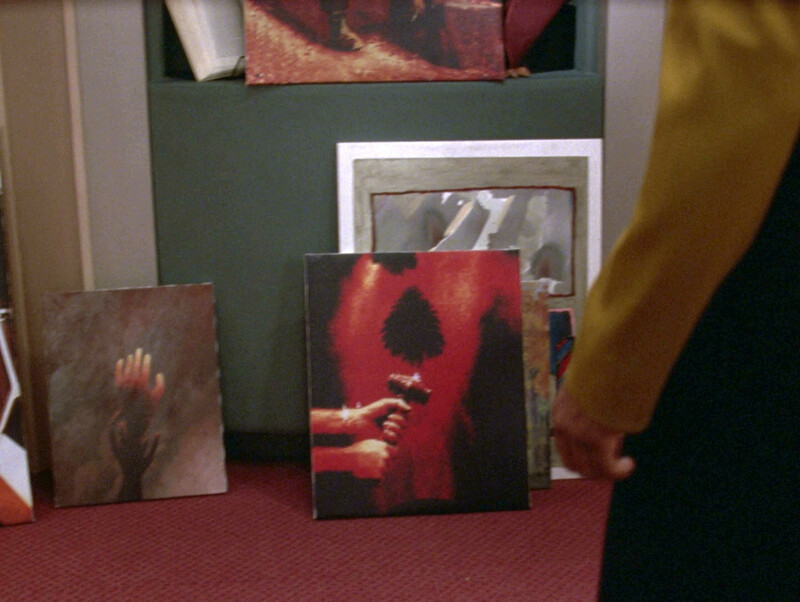 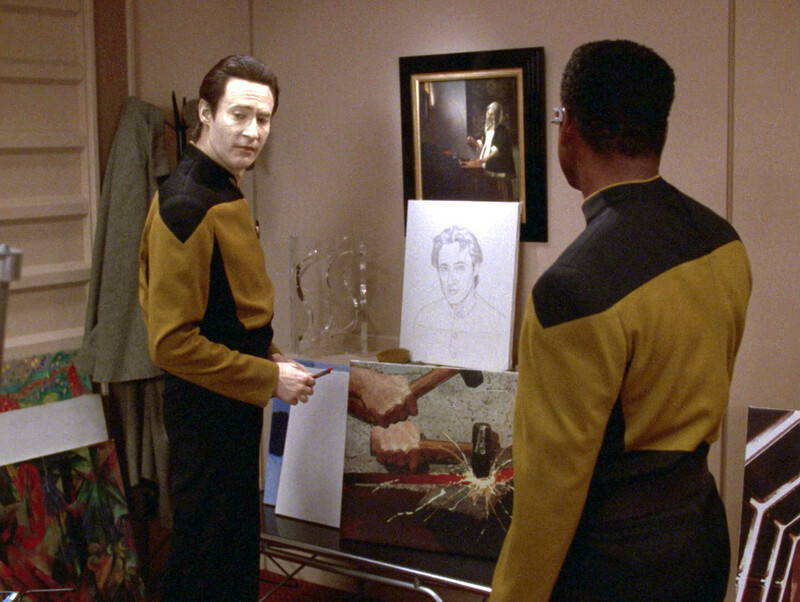 Some of the paintings Data creates in this episode would later be seen again in "Inheritance" when he shows the paintings to Juliana Tainer. 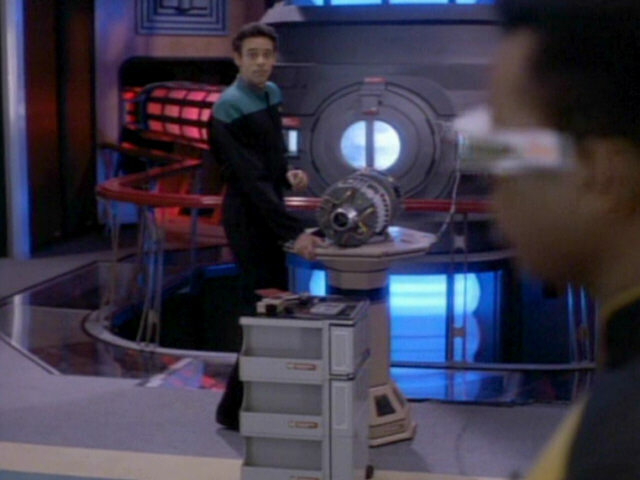 The book in the second screenshot was also visible in "A Matter of Time". 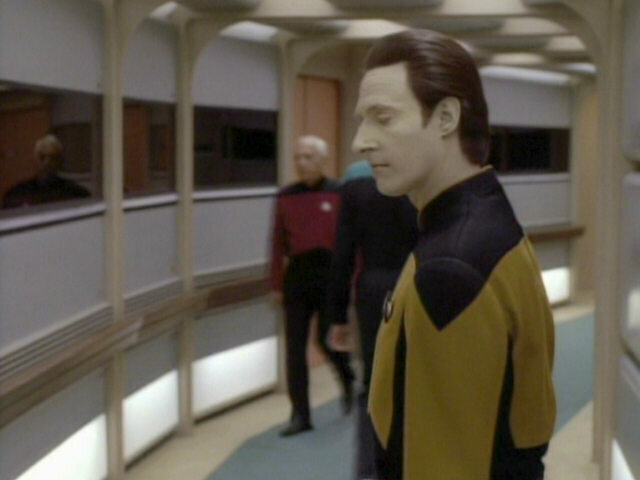 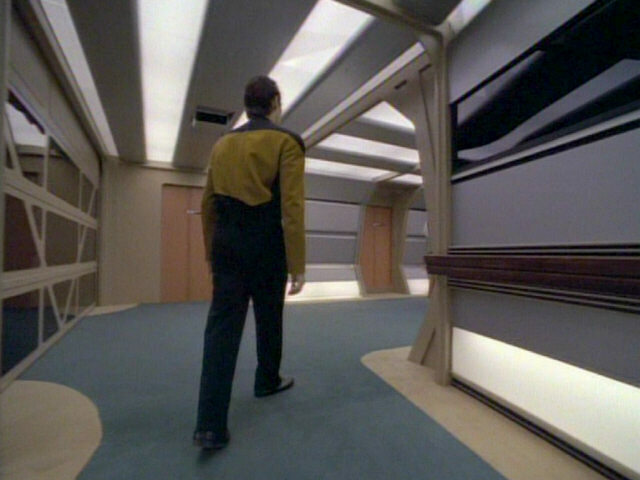 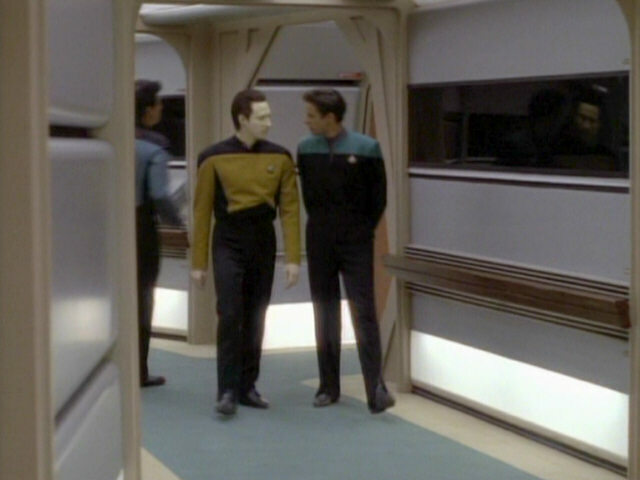 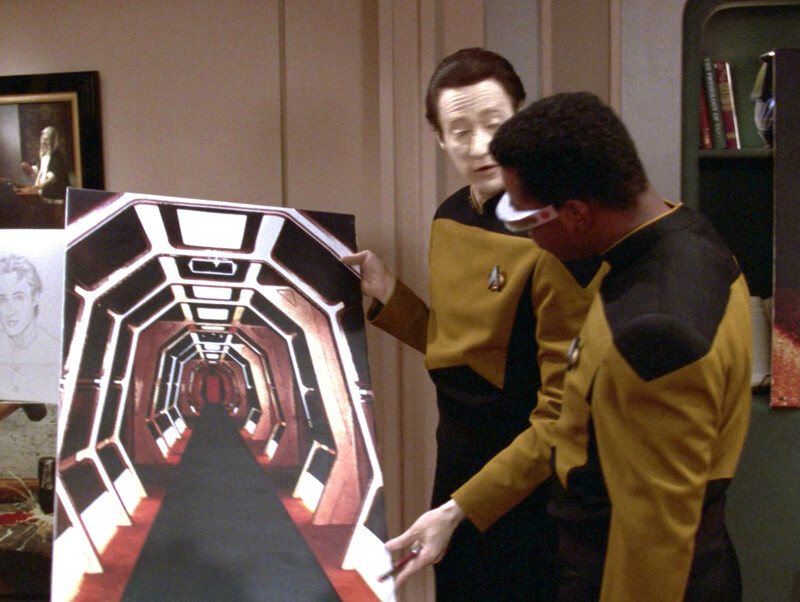 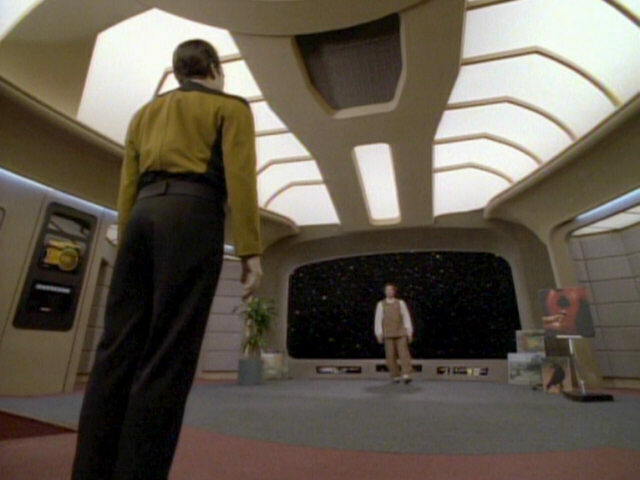 The painting in the third cap features a view of the corridor leading to the transporter room. 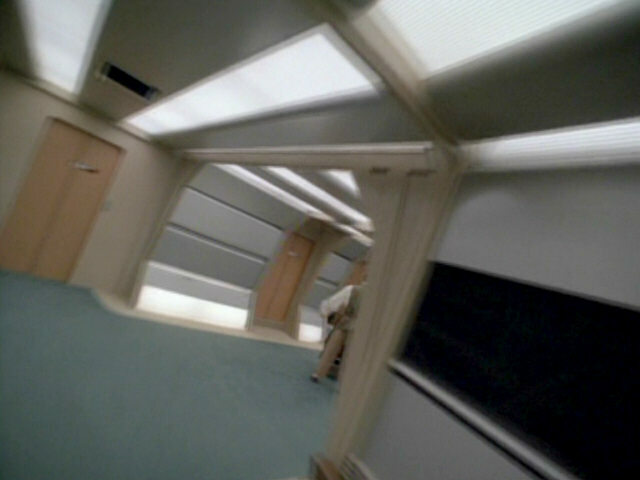 The screenshot from "Frame of Mind" shows the set from the same perspective. 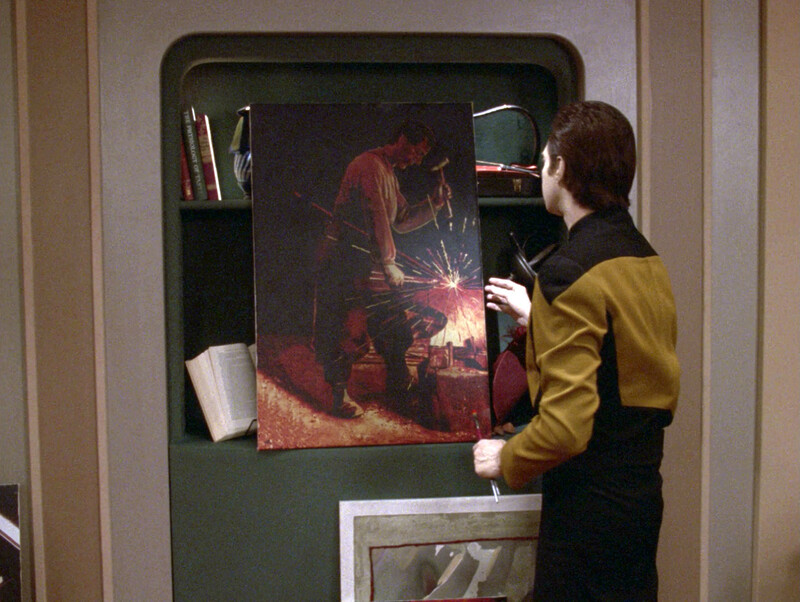 The only difference is that one of the doors on the left (leading to the weapons room in "11001001") is missing in the painting. 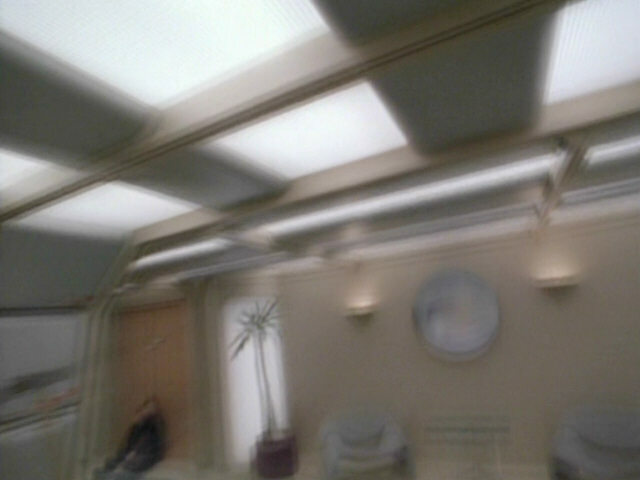 of Time" HD The full title of the book in the second screen cap can be made out in HD: The Physiology of Taste by Jean Anthelme Brillat-Savarin. 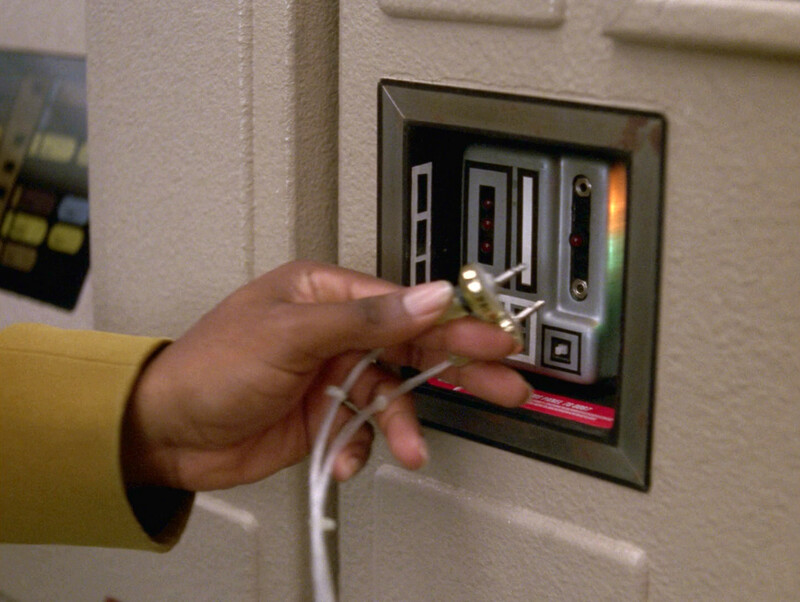 The old-fashioned plugs used by Geordi in this scene also appeared in "A Fistful of Datas". 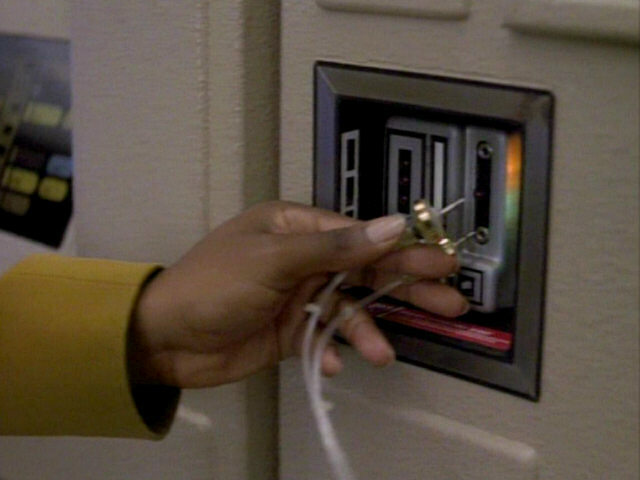 of Datas" HD The wall socket and cable in HD. 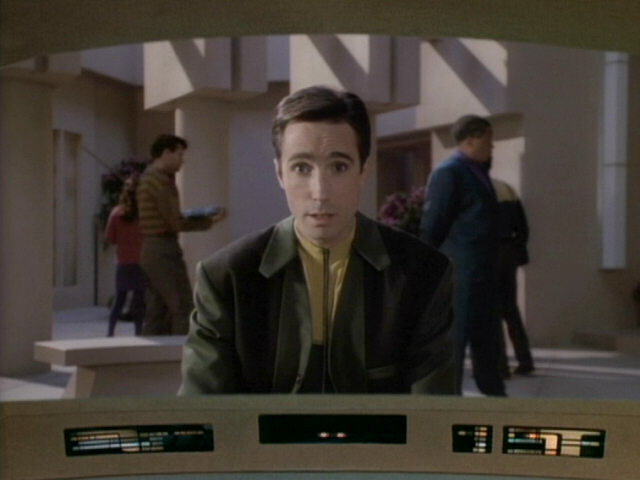 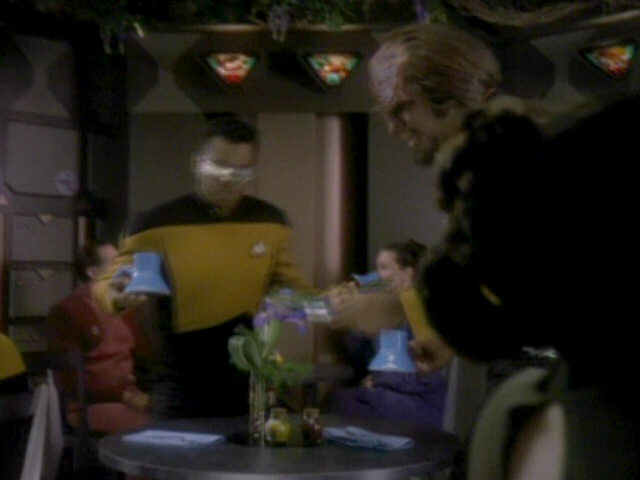 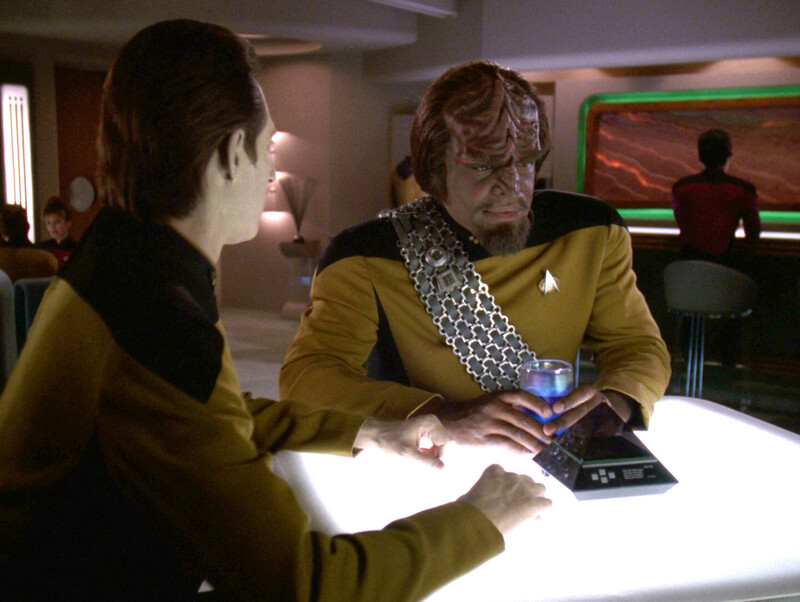 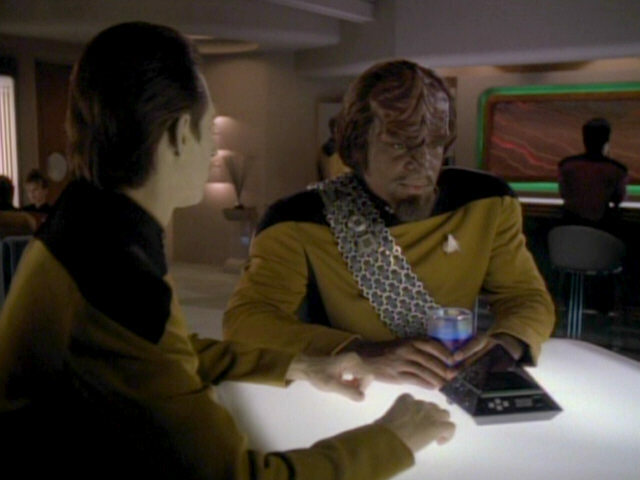 The small table in front of the warp core has appeared in engineering in several episodes, including "The Masterpiece Society". 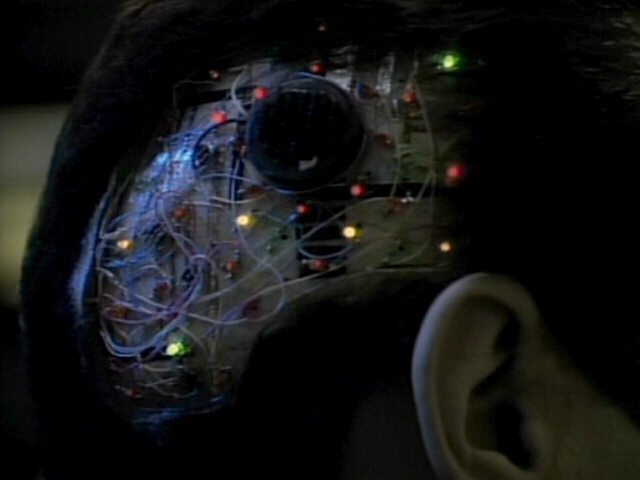 It was also seen in sickbay in "The Host". 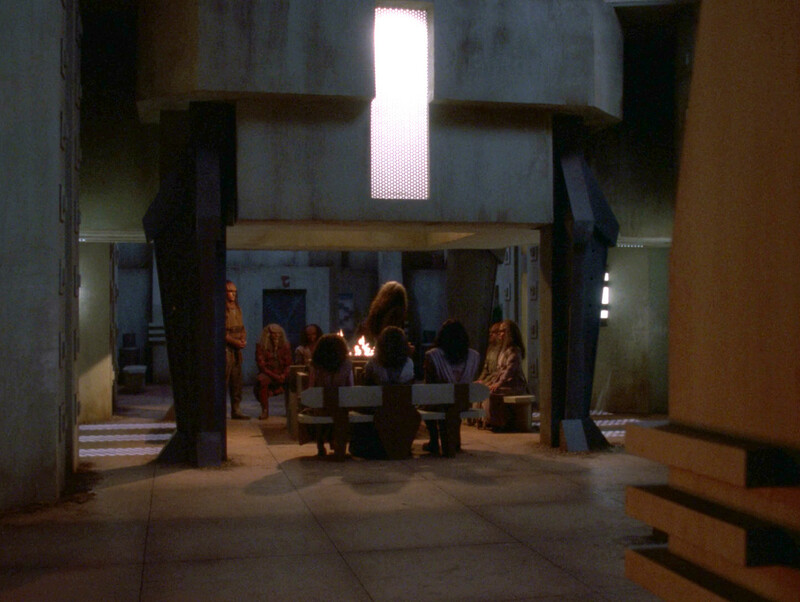 "The Host" HD The table in HD. 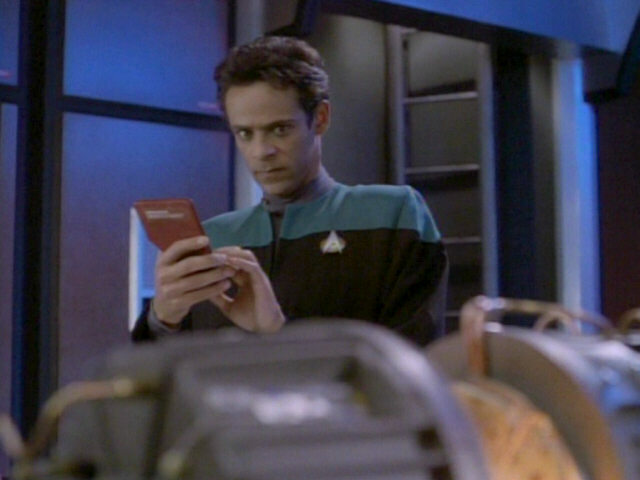 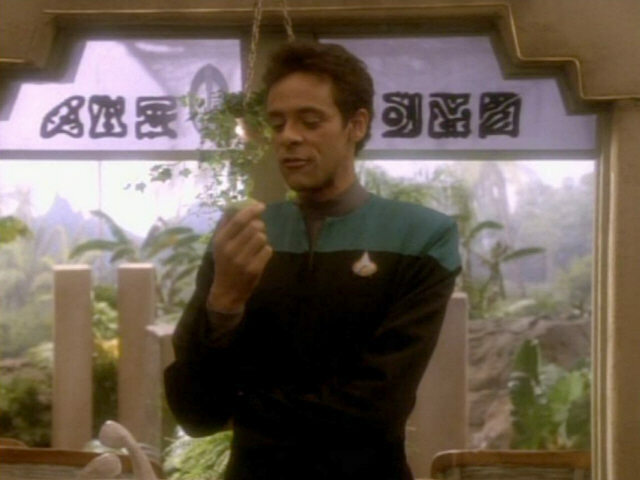 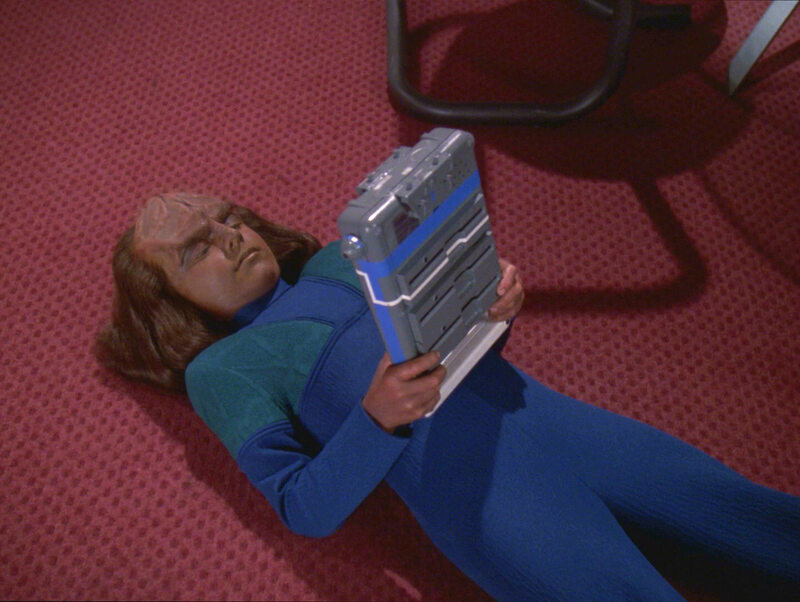 Doctor Bashir holds a red, irregularly shaped PADD in this episode, which is later used by Data in "Timescape". "Timescape" The PADD in HD. 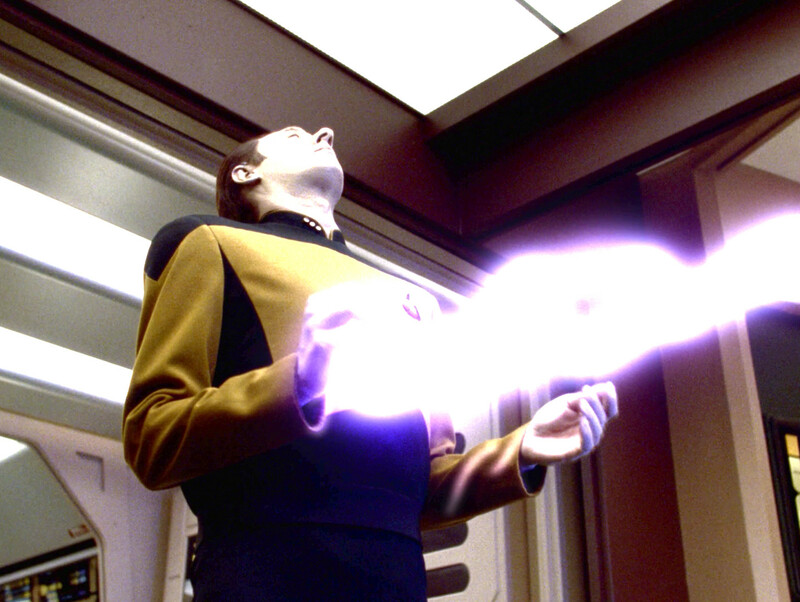 Another energy beam is fired by the alien field generator. 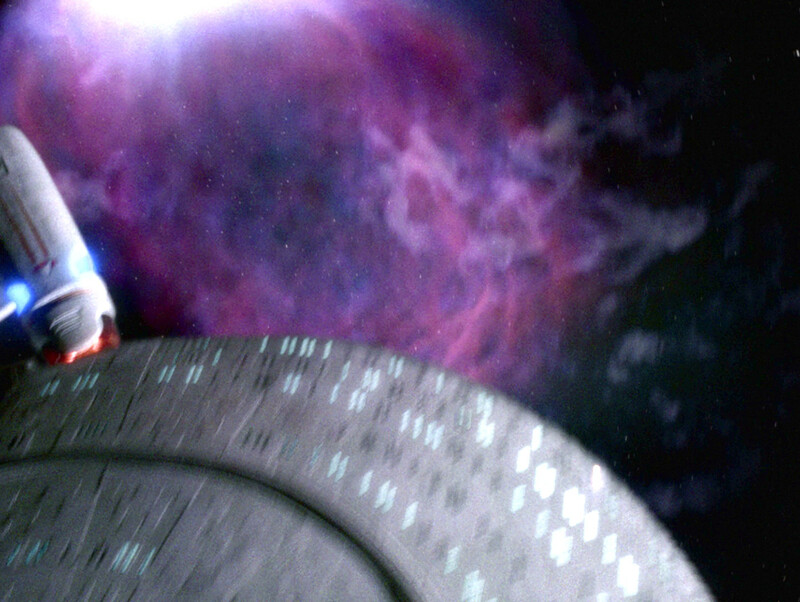 The effect was reconstructed for TNG-R and, like the first time earlier in the episode, is brighter now. 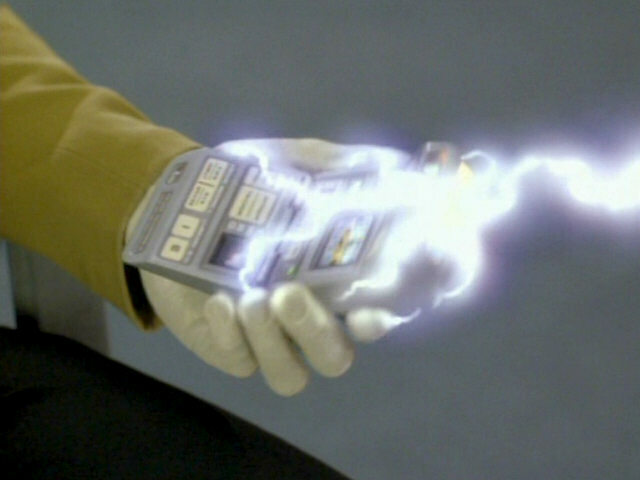 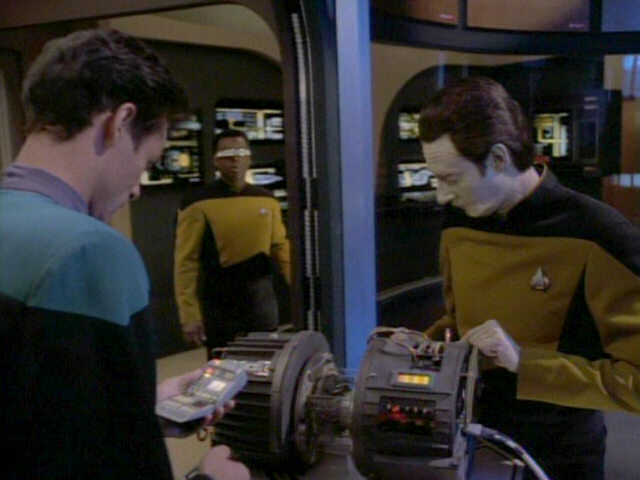 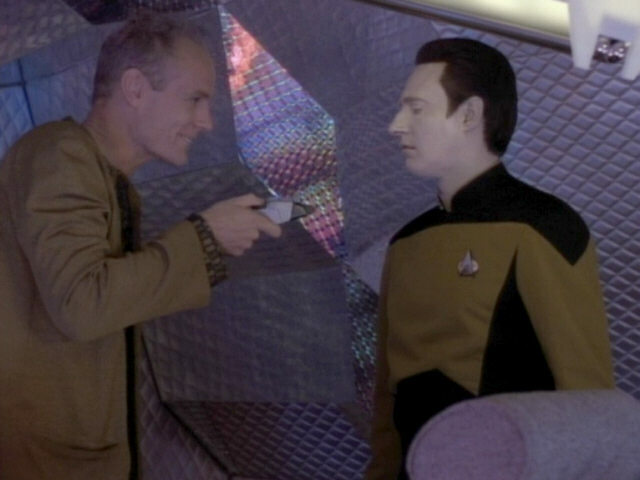 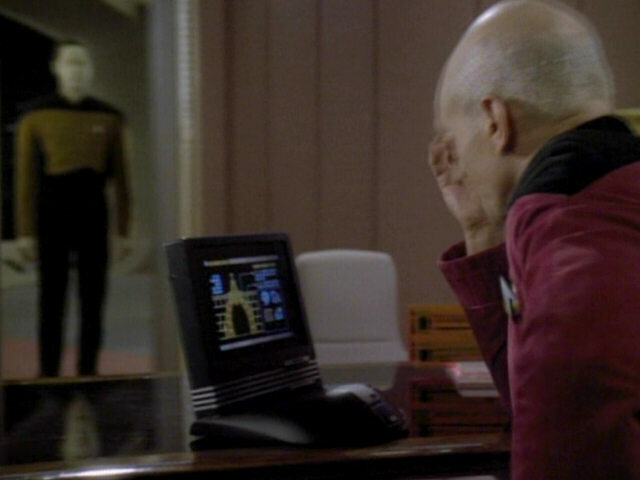 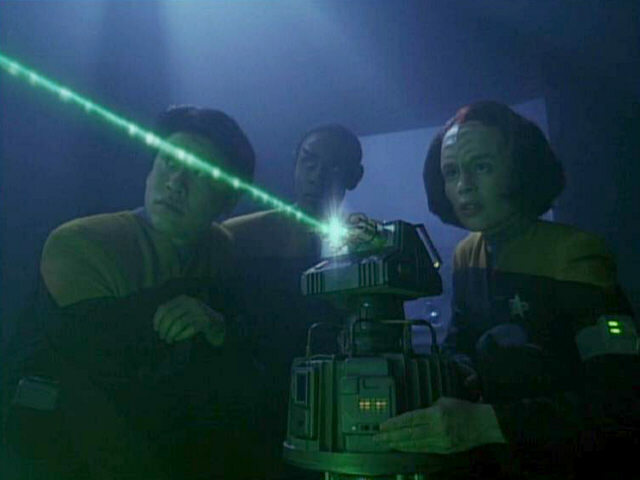 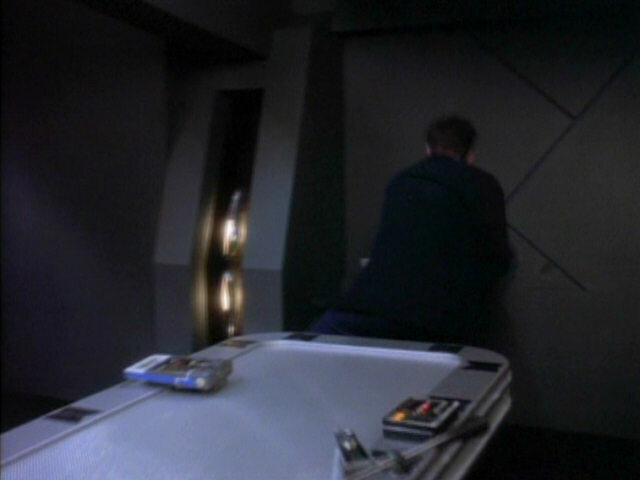 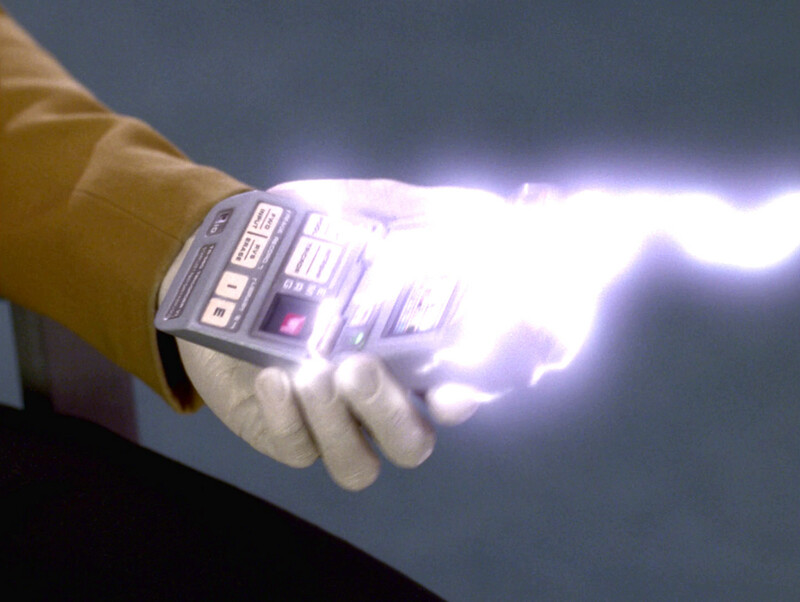 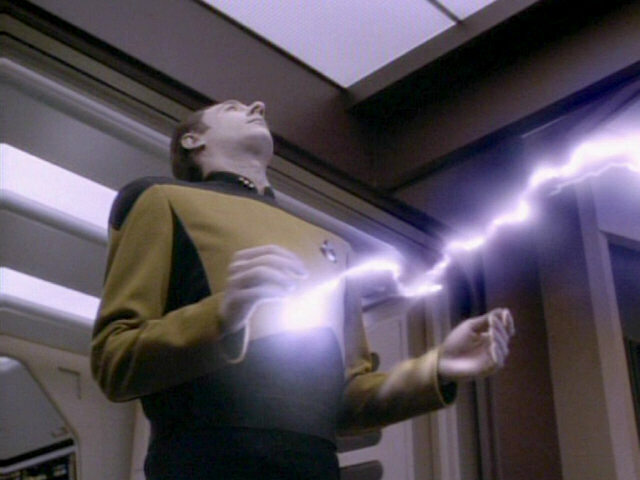 Data's science tricorder can be seen up close, shortly before it is hit by the energy beam. 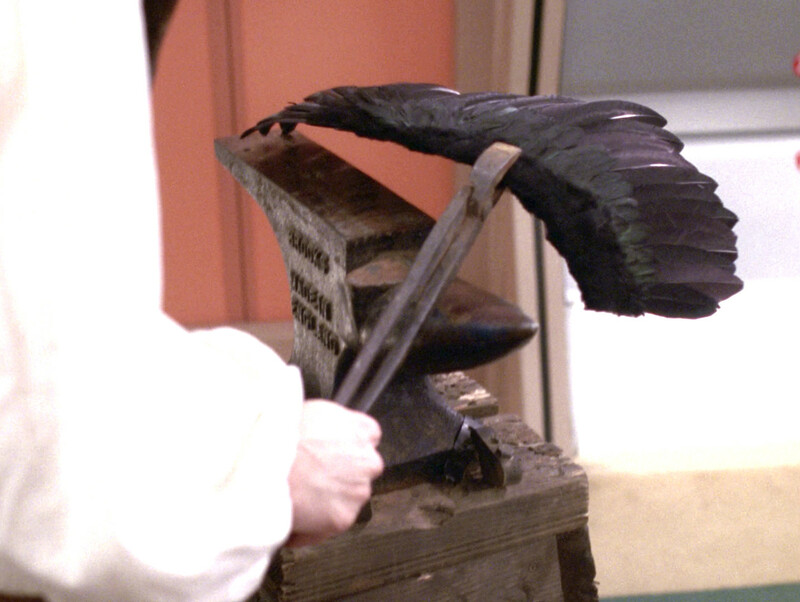 Dr. Soong's anvil. 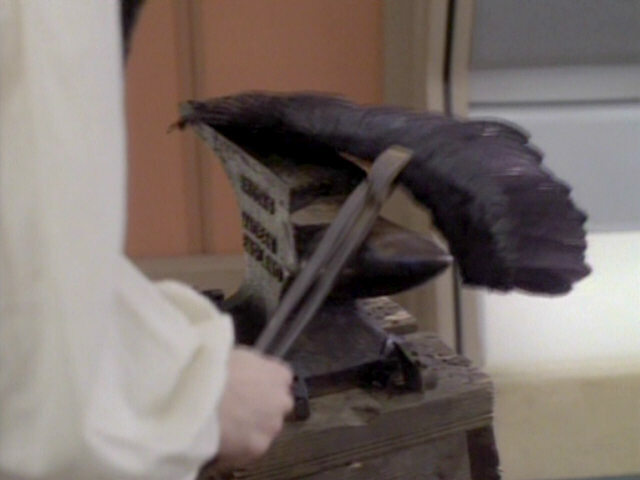 In HD, the words "Brooks Made in England" can be read on the side of the anvil. 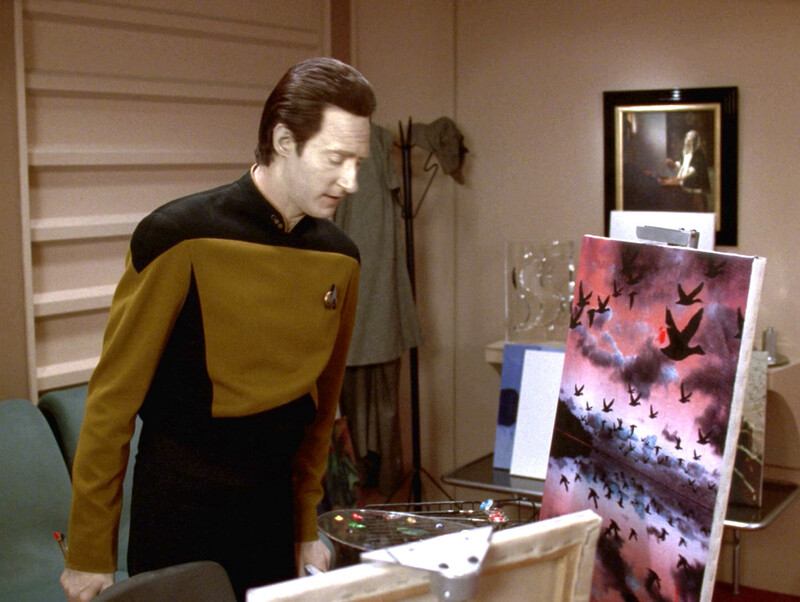 The painting on the floor, to the left of the raven painting, was created by Data in "Hero Worship". 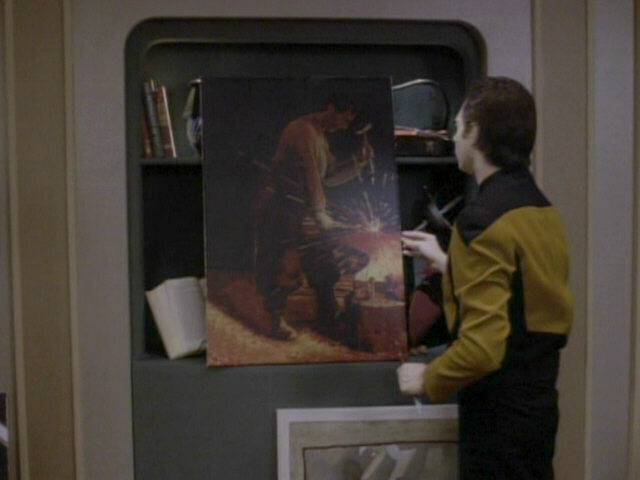 "Hero Worship" A look at the paintings in HD. 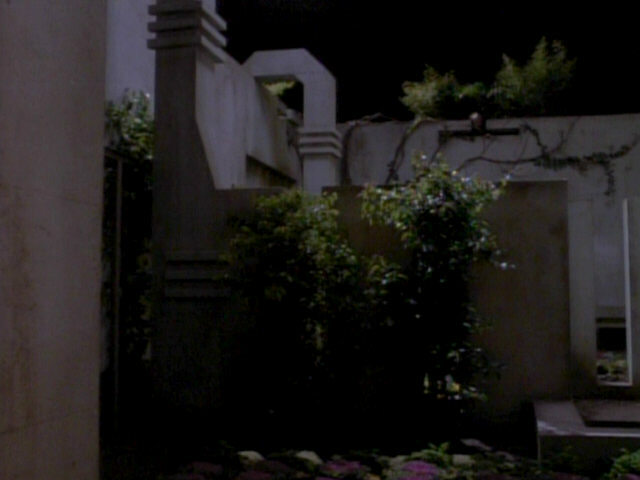 In the original version of the episode, makeup artist June Abston Haymore can famously be seen sitting on the ground in front of an orange door in Data's dream sequence. 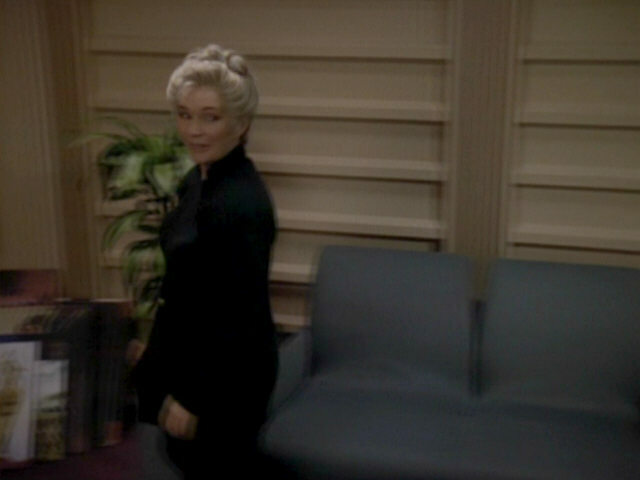 While she is still briefly visible in the remastered version of the episode at the beginning of the sequence (first screenshot), she was digitally removed from the more obvious shot a few frames later. 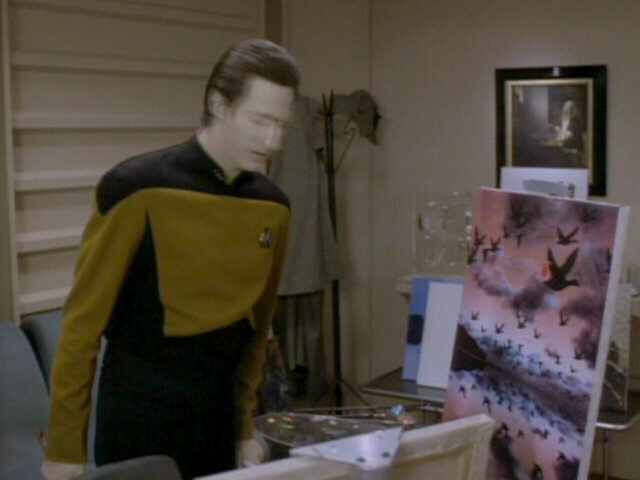 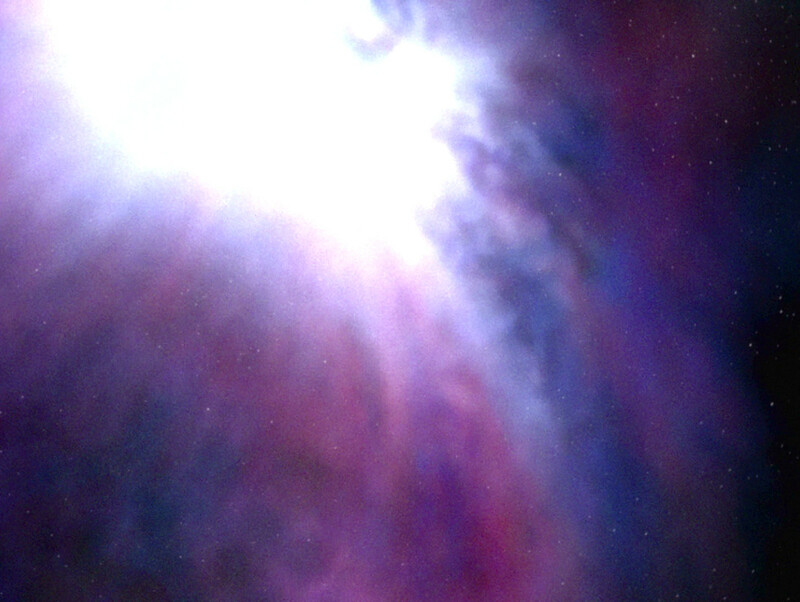 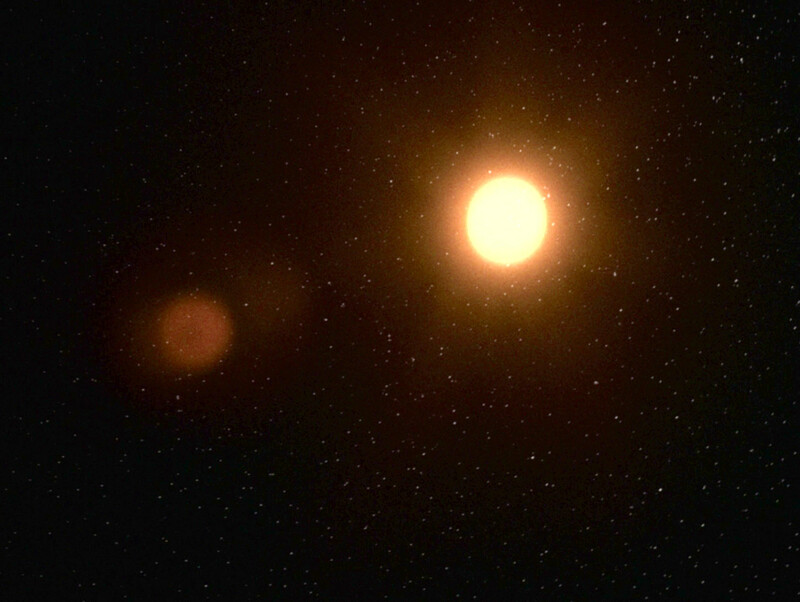 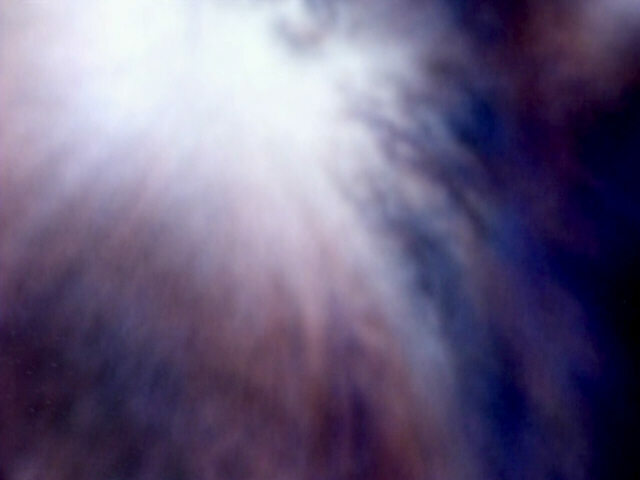 In Data's dream, he flies past a sun, the USS Enterprise-D and a nebula. 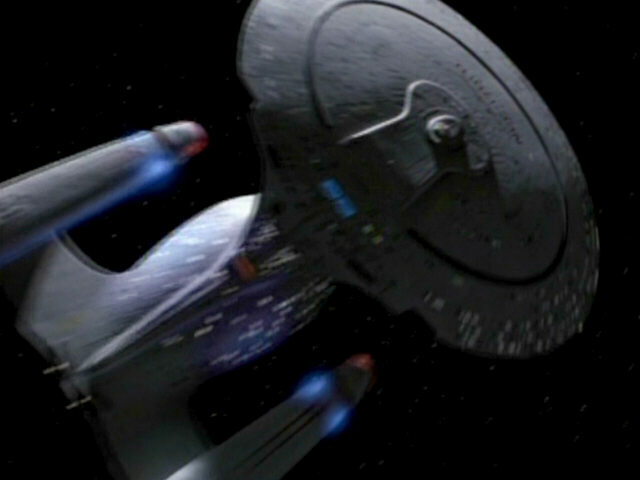 The footage of the USS Enterprise-D was newly filmed for this episode, using the 4-foot model. 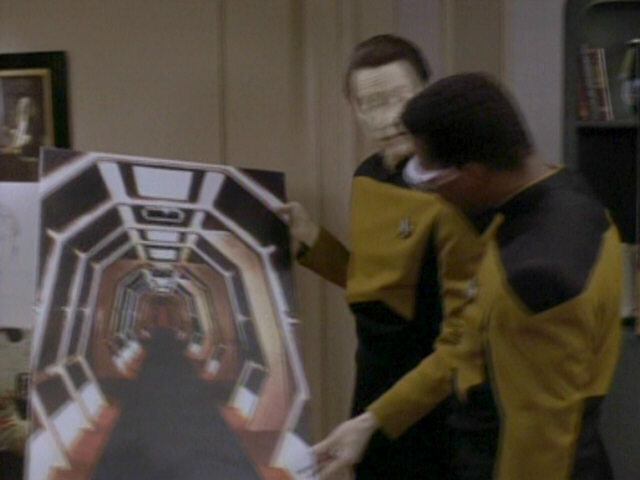 Incidentally, no stock footage of the 6-foot model appears in this episode. The great sequence in HD. 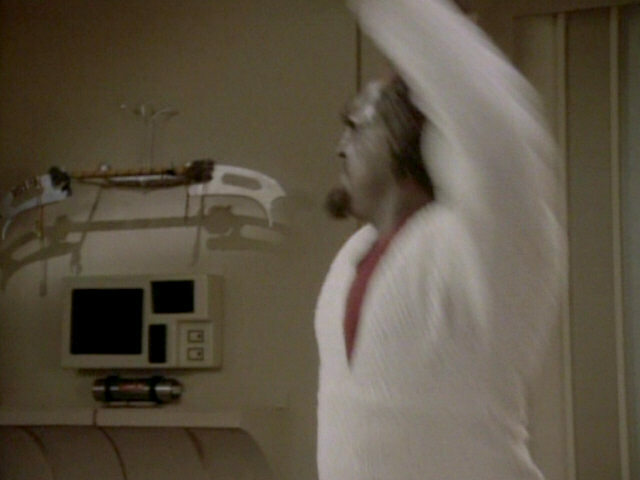 Another famous blooper appears in this episode. 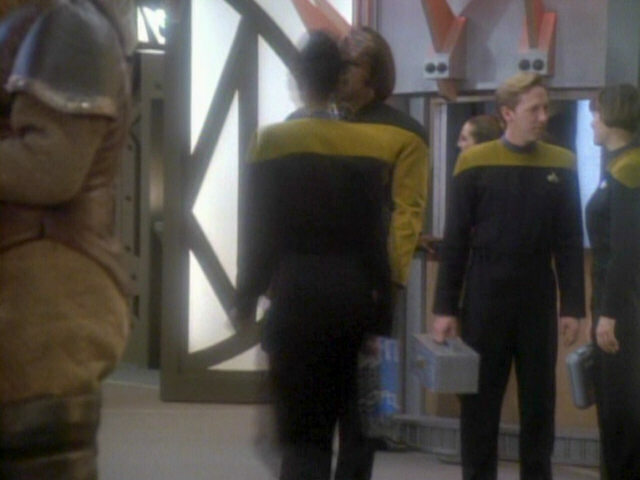 At the beginning of the scene, Bashir is seen wearing regular black Starfleet boots. 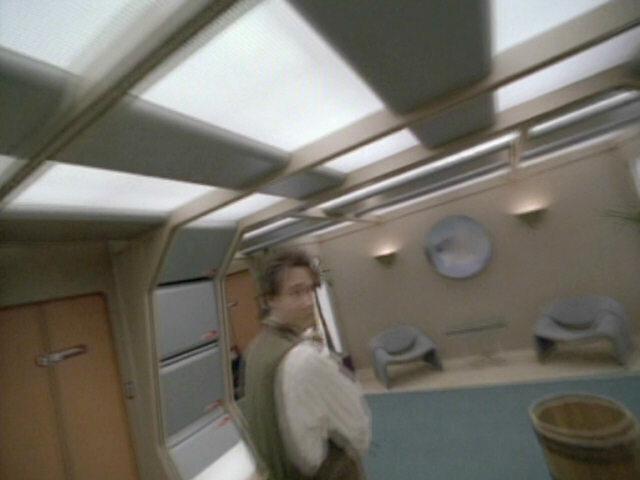 In the final shot of him walking away from the camera, however, he is seen wearing white sneakers instead. 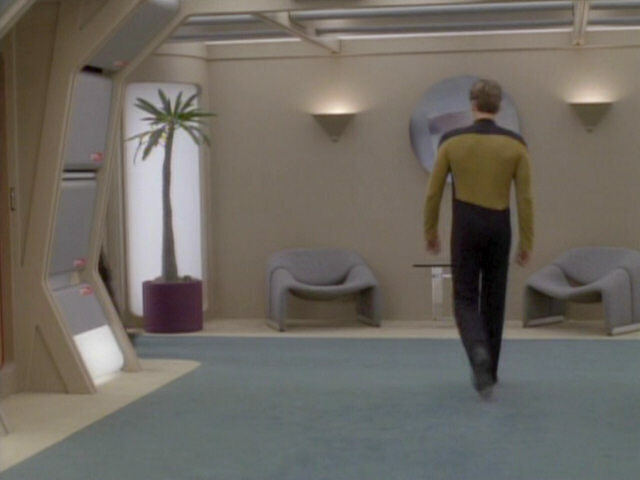 Bashir still wears the white shoes when he walks away in the remastered episode. 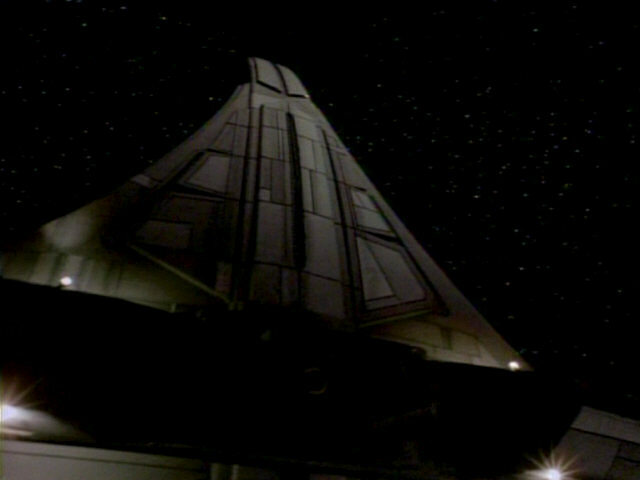 The impressive large courtyard of the Romulan prison camp on Carraya IV, seen in this and the next episode can be seen well in these two screenshots. 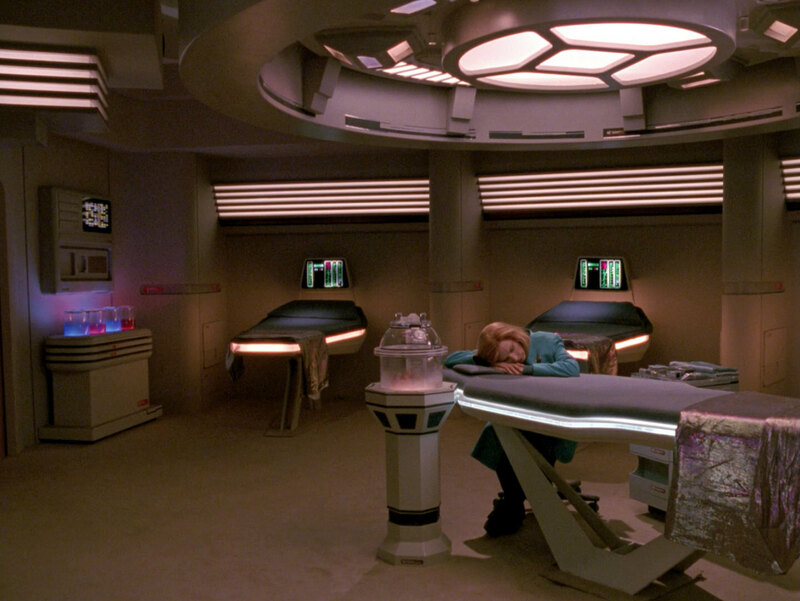 A look at the set in HD. 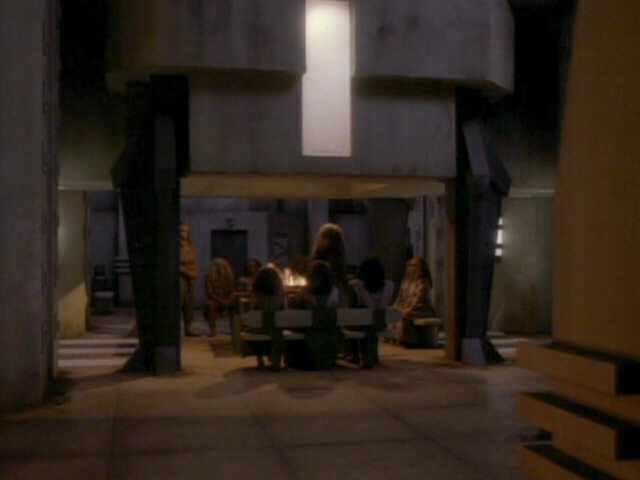 Even though the prison camp is supposed to be Romulan, the meeting hall features several design elements normally associated with the Klingons, as seen in the screenshot from "The Mind's Eye".